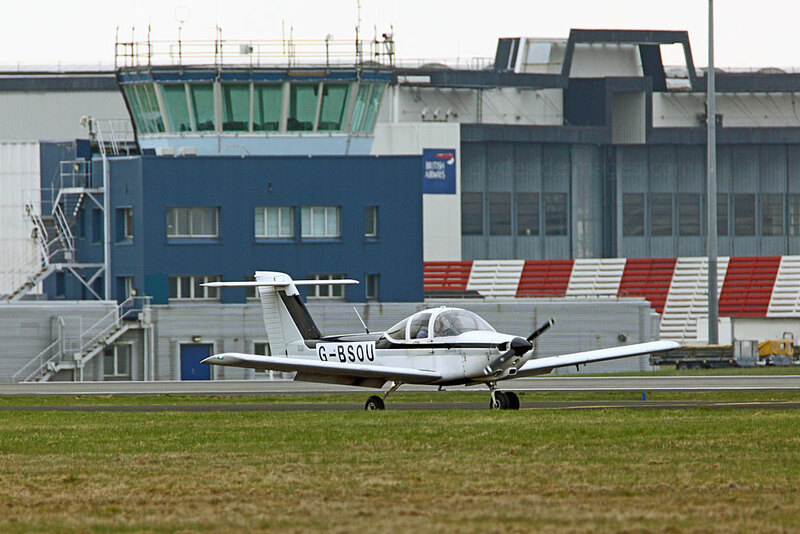 April this year was fairly quiet with regard to stand-out visitors but with the summer schedule due to kick-in soon, the volume and variety of aircraft should increase rapidly. 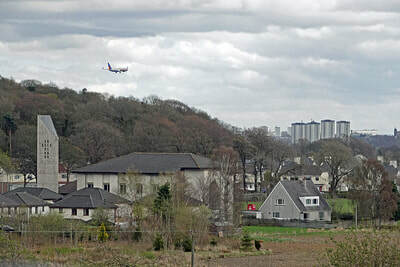 Canadian operator Westjet began its summer service between Glasgow, Toronto and Halifax on 30 April, initially using Boeing 737-7CT(WL) C-GWCN. 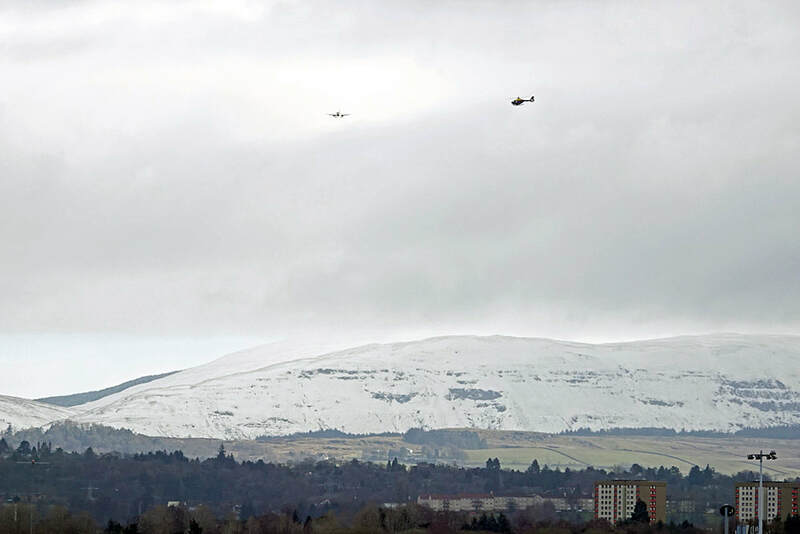 This year`s sole Joint Warrior was ongoing during April and, as usually happens, Glasgow saw some military traffic as a result. The large-scale exercise usually takes place twice each year, however, due to political tensions and military commitments across the globe, the autumn one has been cancelled. 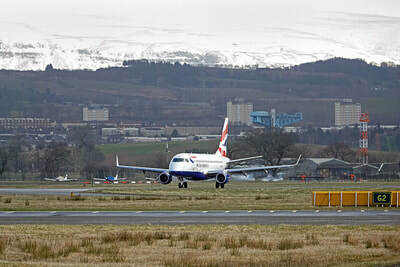 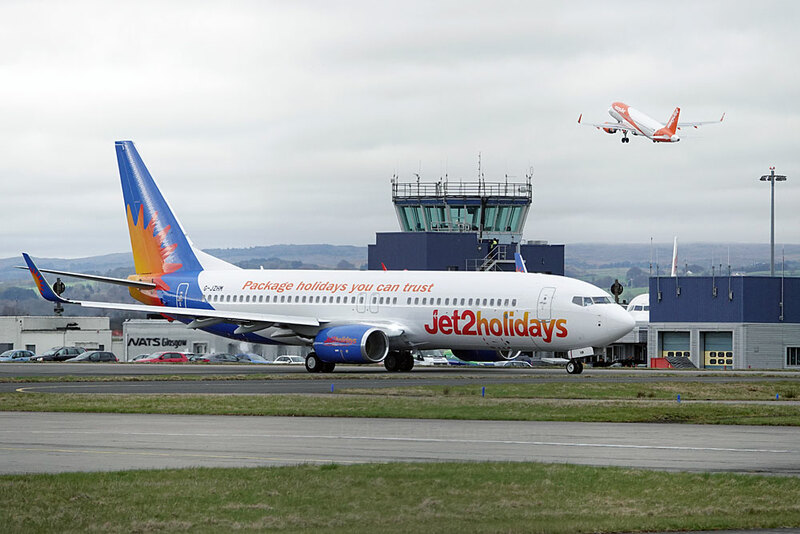 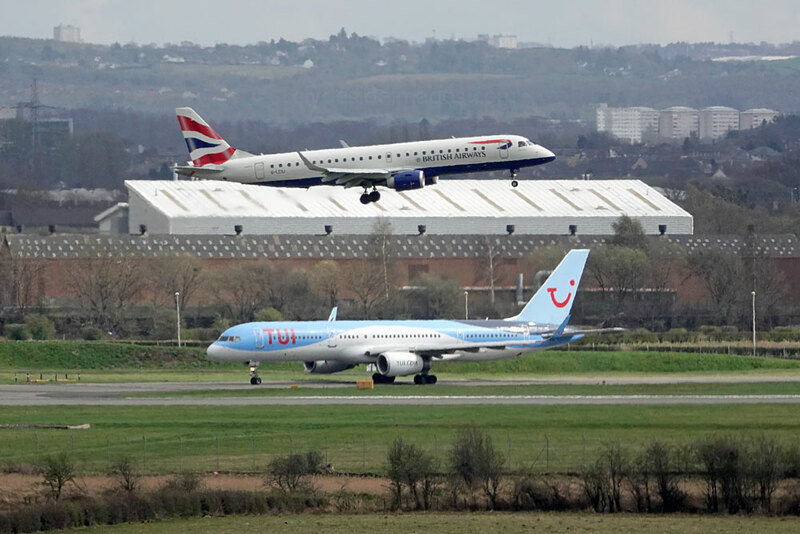 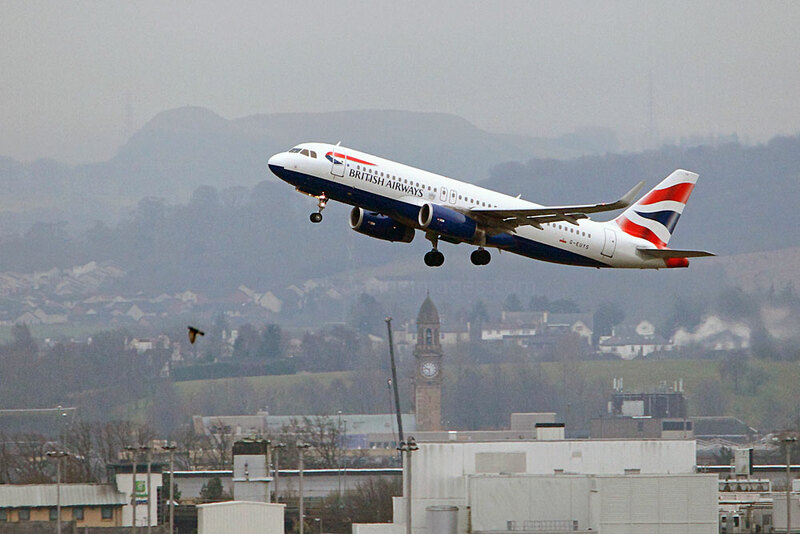 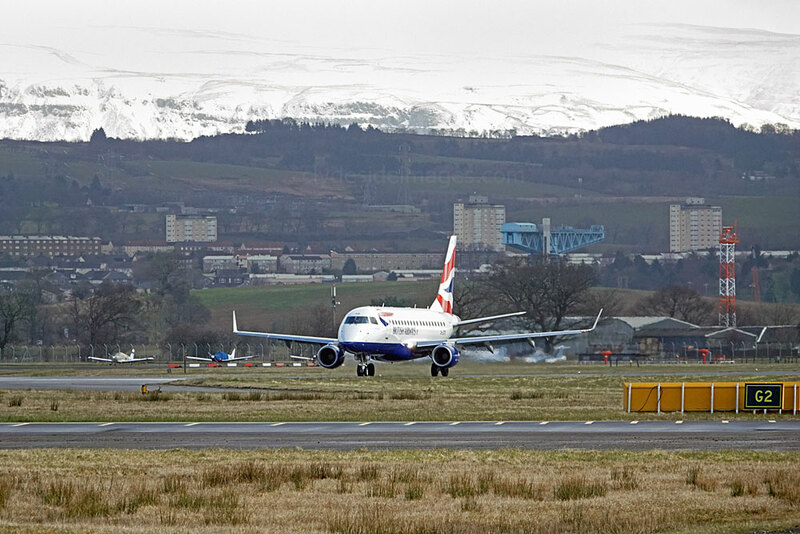 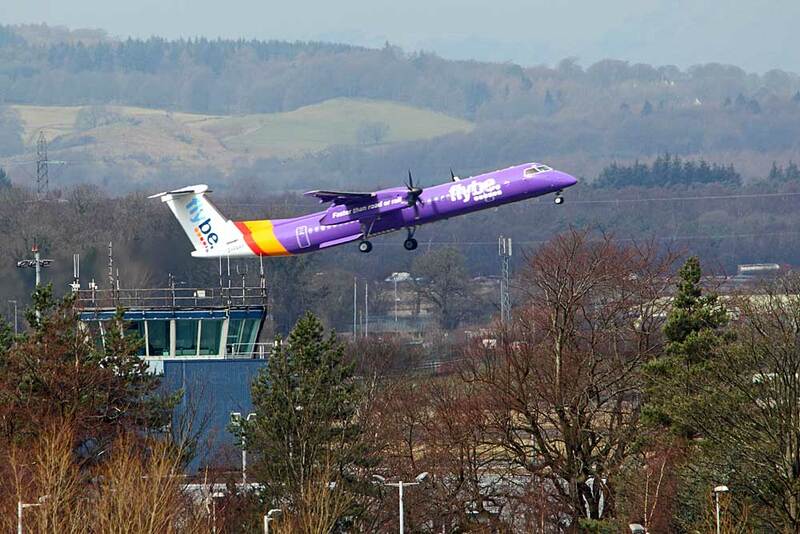 As far as I`m aware, Team Glasgow have still to release passenger figures for February and March this year which may indicate reluctance to divulge any reduction in traffic, as for a while now positive results were announced at the earliest opportunity. 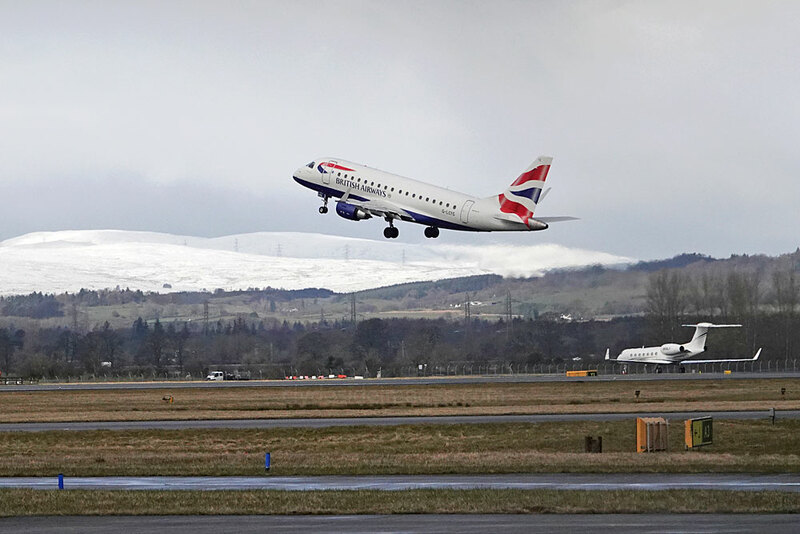 Civil Aviation Authority (CAA) figures for March 2018 confirm passengers transiting the airport were at 665,000, which was down 5.9% compared with March last year but this was in part due to the impact of adverse weather. 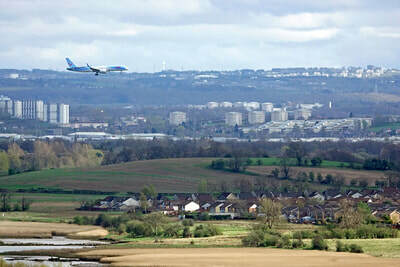 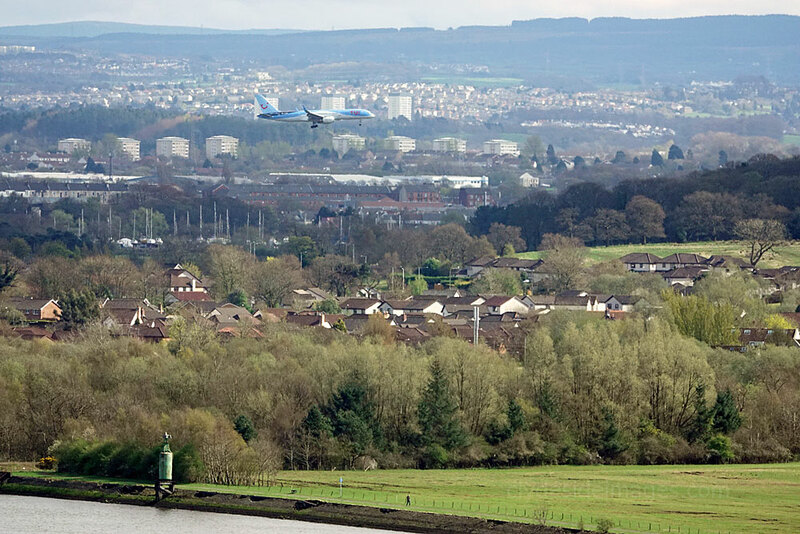 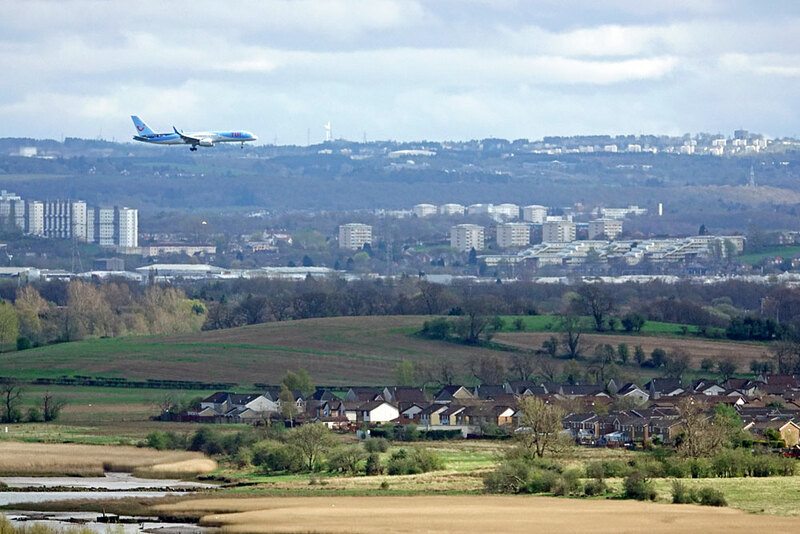 A TUI Boeing 757 on short finals for Runway 23, seen from the Erskine Bridge. 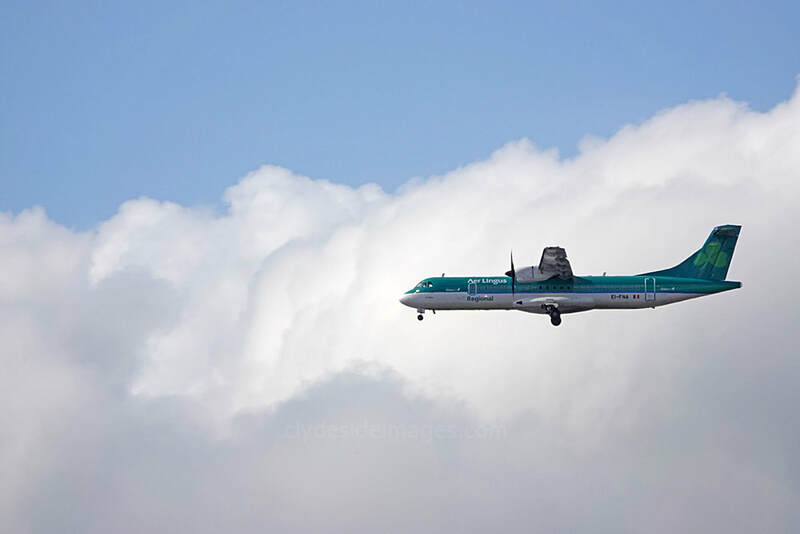 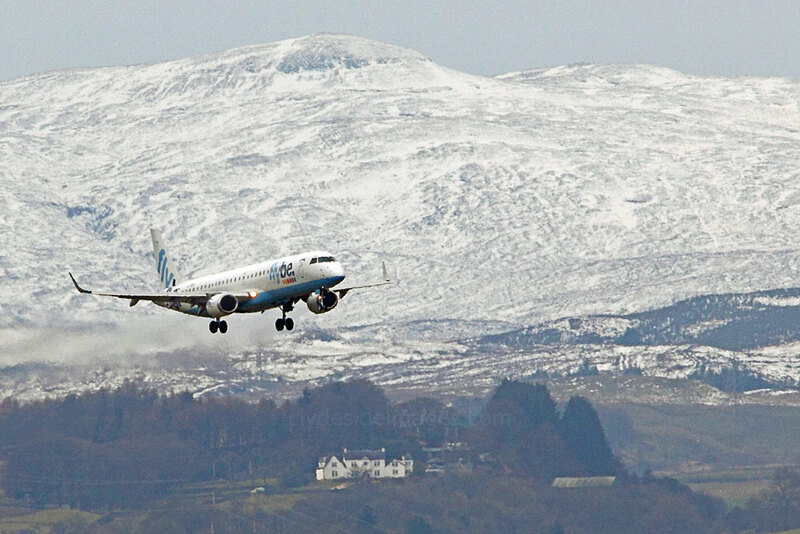 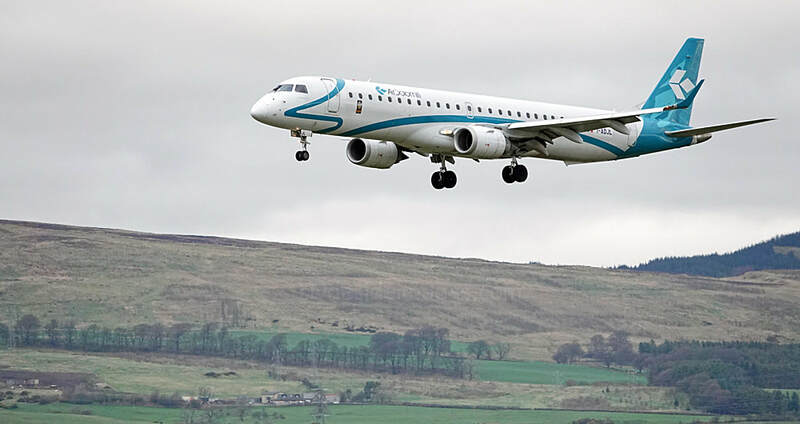 Pictured here about to land on the 18th, Air Dolomiti ERJ-195-200LR I-ADJN (f/v) was operating a Lufthansa flight into Glasgow. 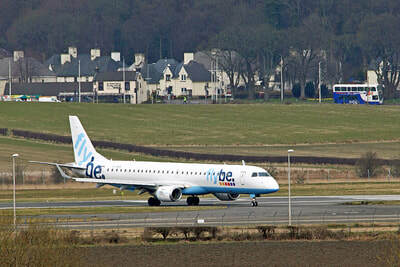 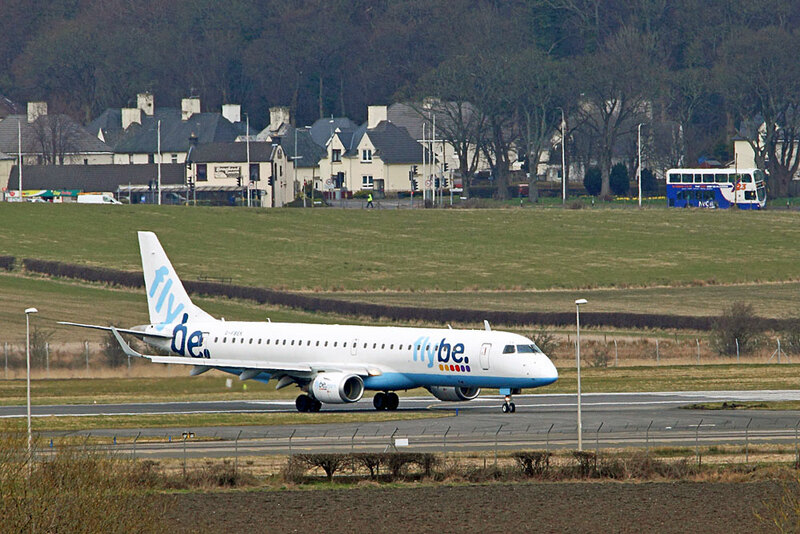 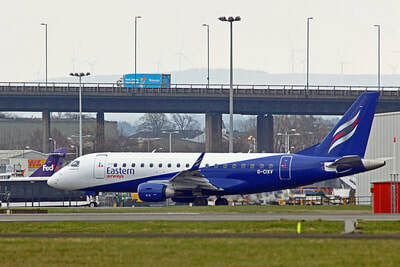 Flybe Embraer ERJ-195LR G-FBEF lifts off from Runway 05 on the 28th. 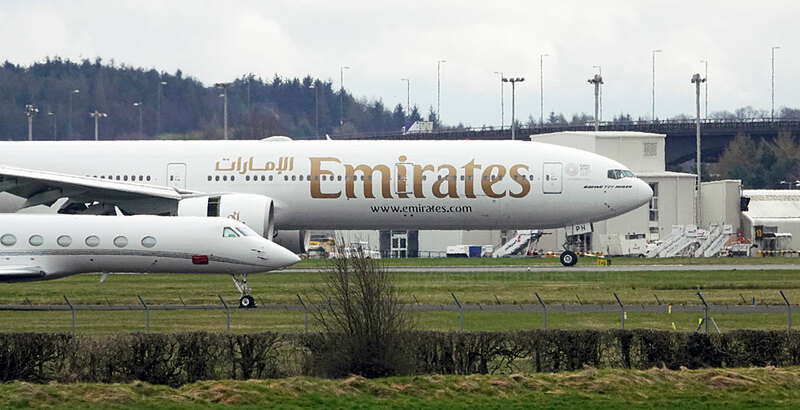 Embraer ERJ-195-200LR I-ADJV Air Dolomiti (Star Alliance colours) (f/v) (25th); ​Boeing 777-31H(ER) A6-EPK Emirates (Expo2020 colours) and Boeing 737-8 MAX TF-ICE Icelandair (f/v) (28th); Airbus A320-271N D-AINJ Lufthansa (f/v), plus Boeing 737-7CT(WL) C-GWCN kicked-off Westjet`s summer service between Glasgow and the Canadian east coast cities of Toronto and Halifax (30th). 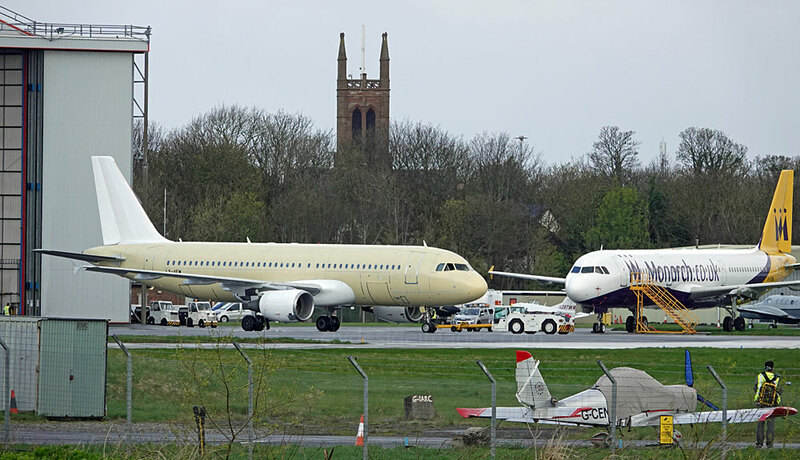 Lufthansa A320-211 D-AIPM made its first visit to Glasgow International on the 20th. 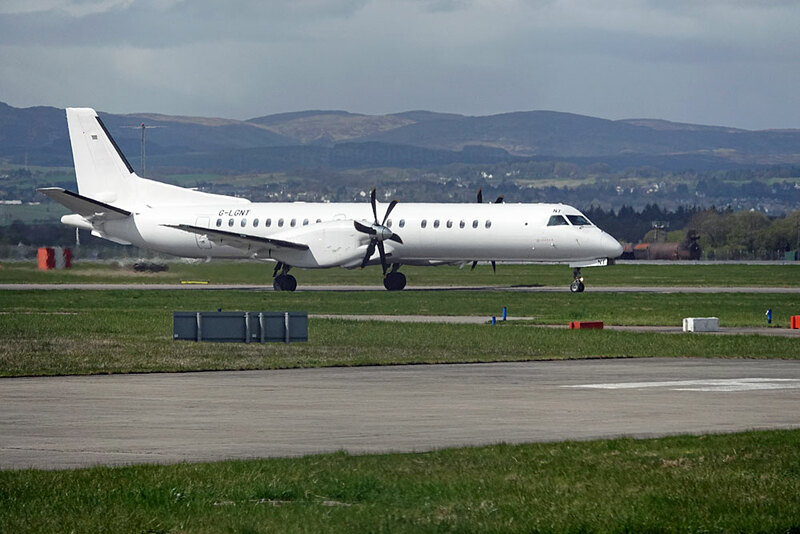 Very quiet on the turbo-prop front this month with Aurigny Air Services ATR 42-500 G-HUET, seen here on the 13th, being the only aircraft of note. 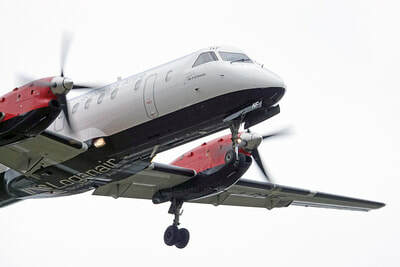 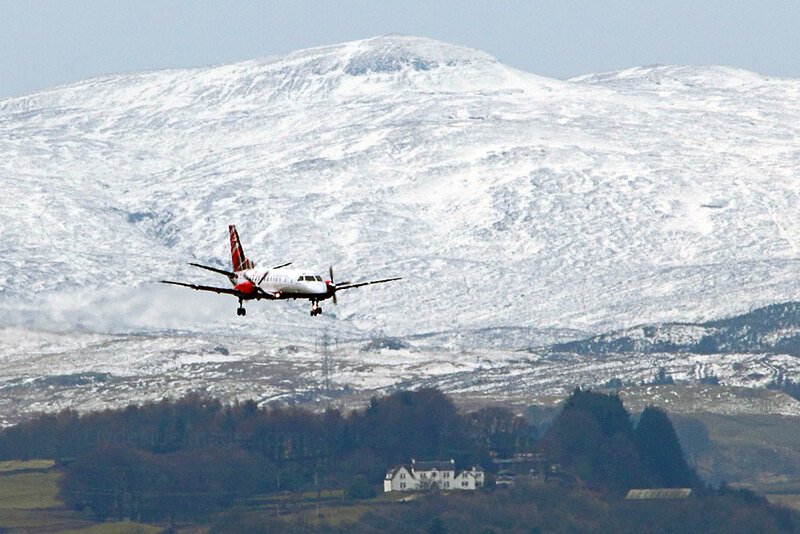 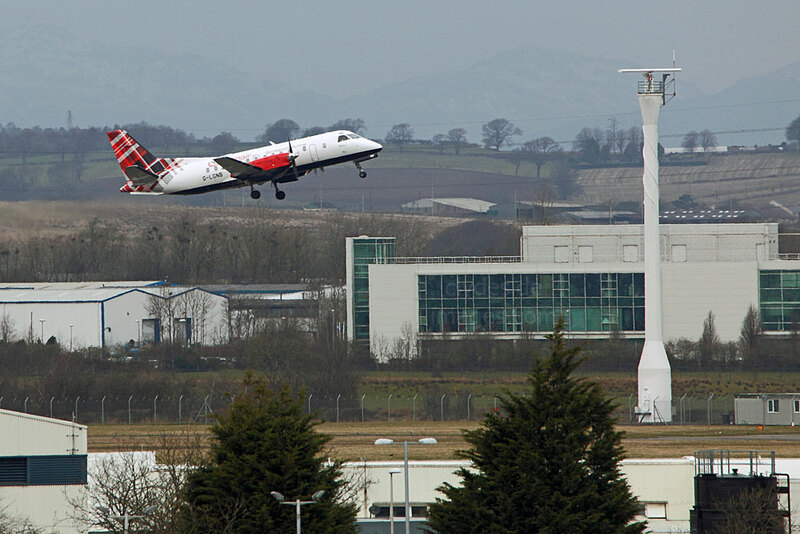 ​Loganair announced that it has further boosted its international connectivity by signing an `interline agreement` with three major airlines, with four more in the offing. 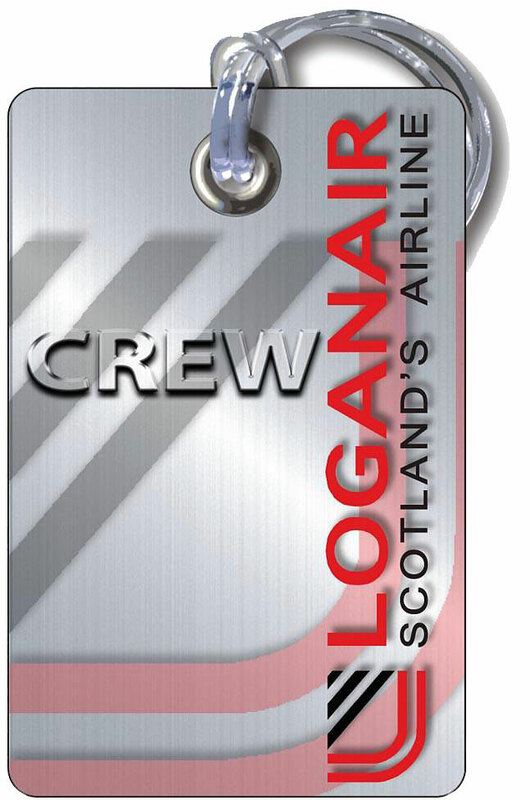 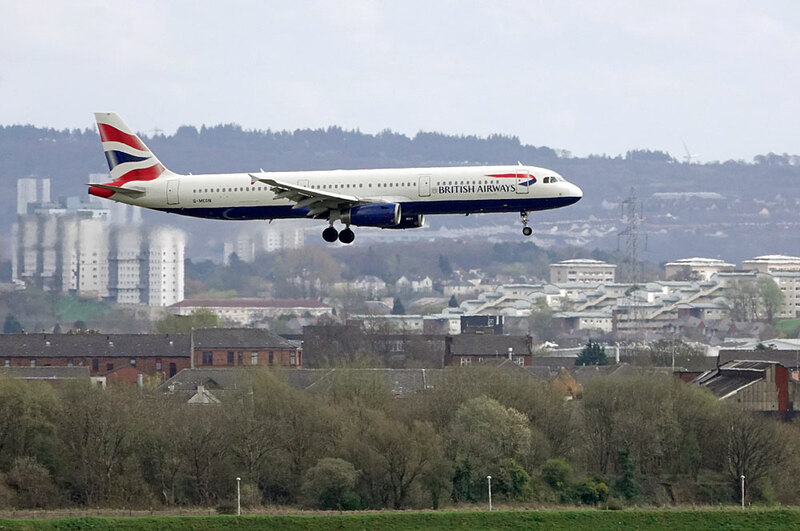 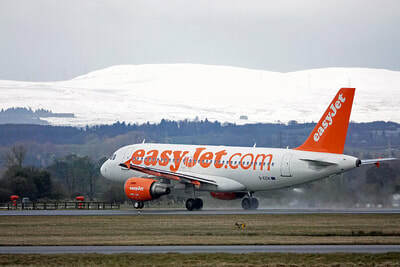 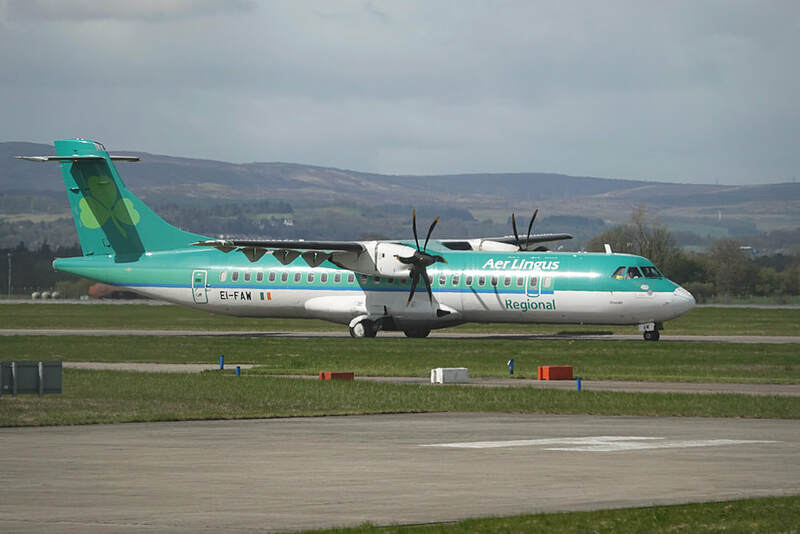 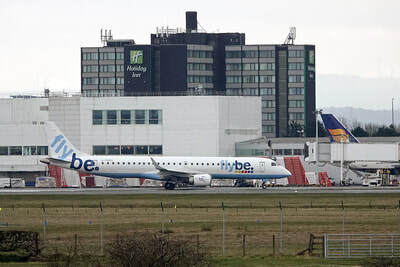 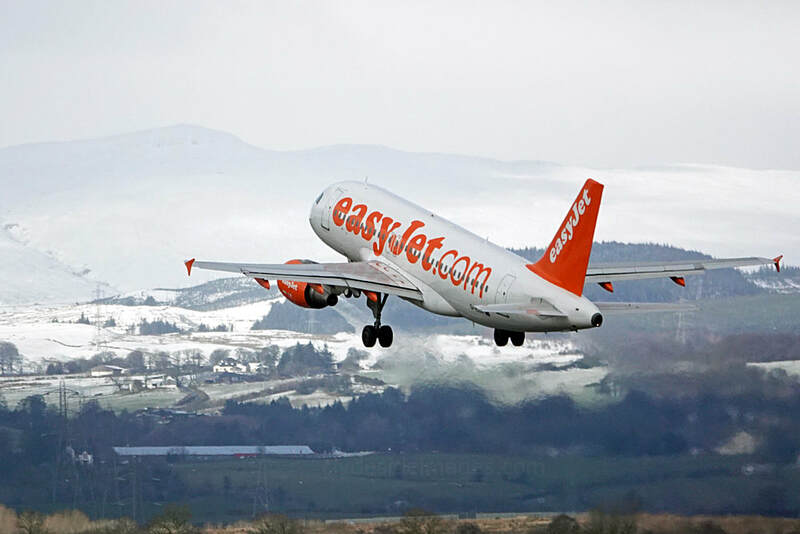 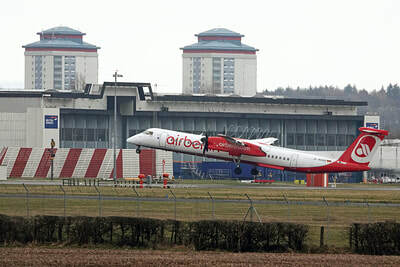 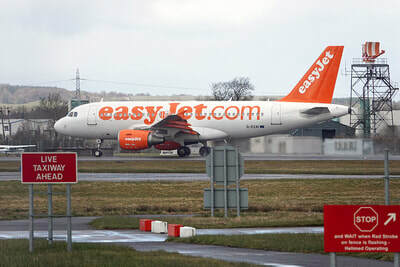 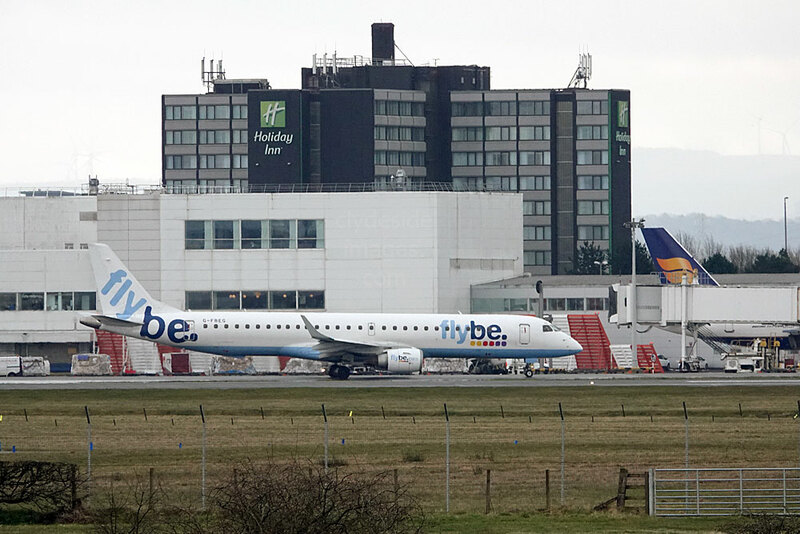 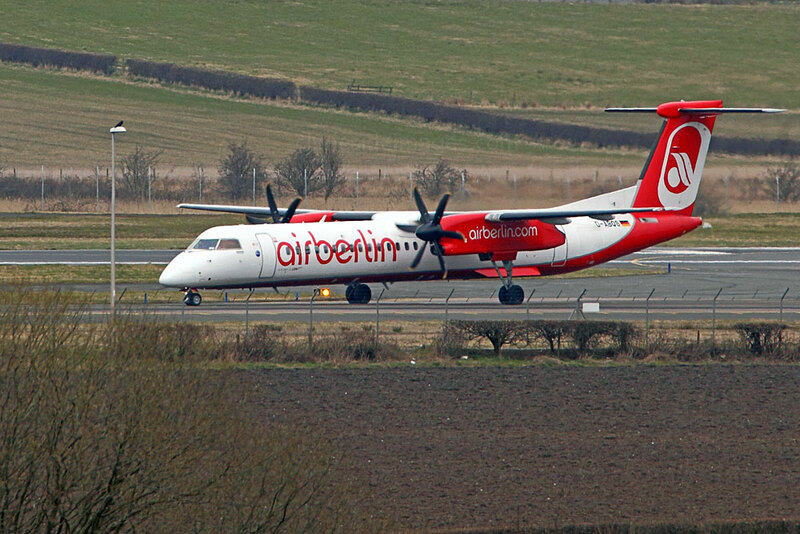 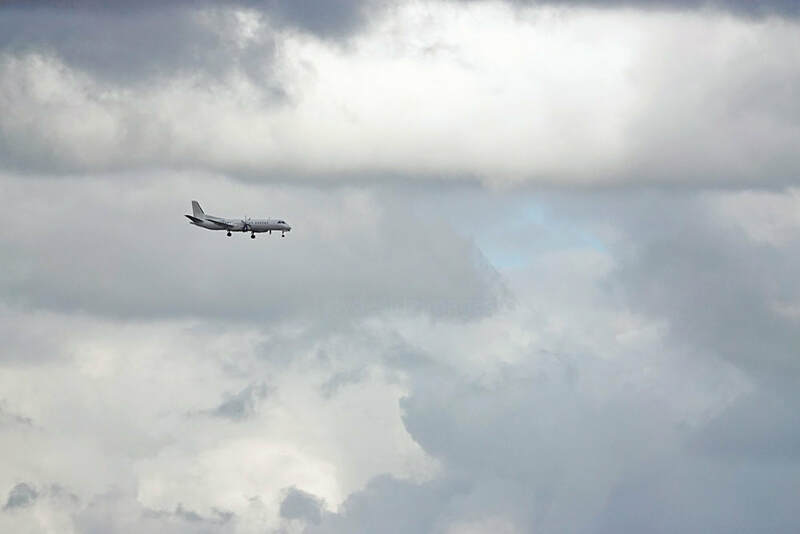 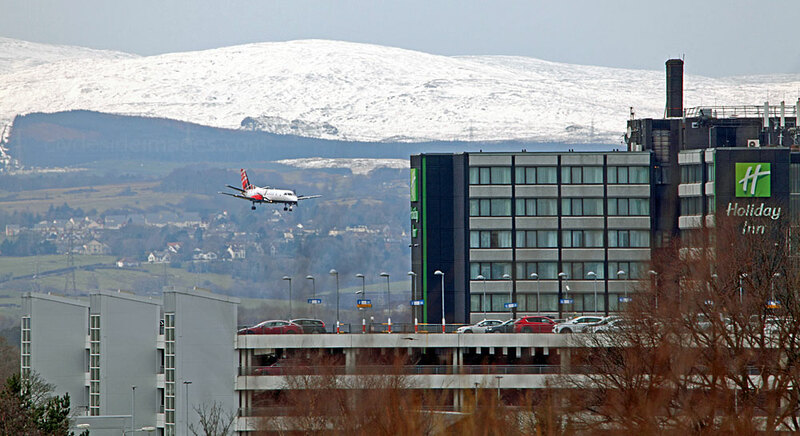 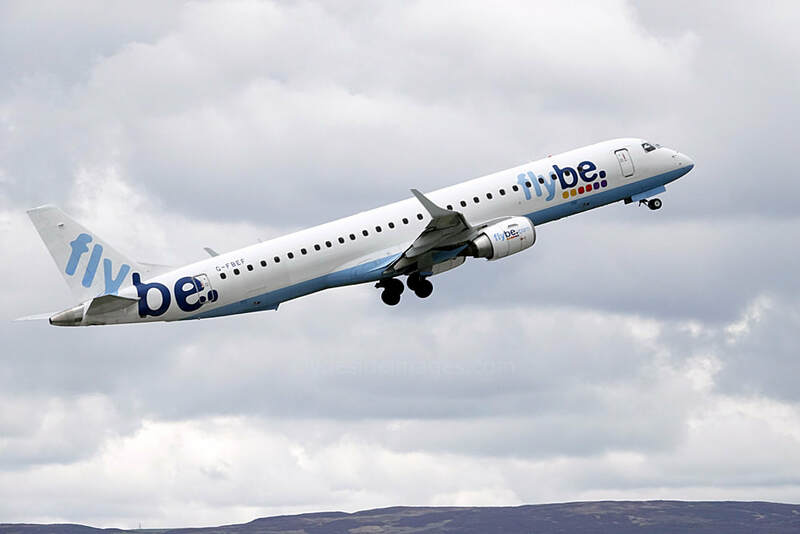 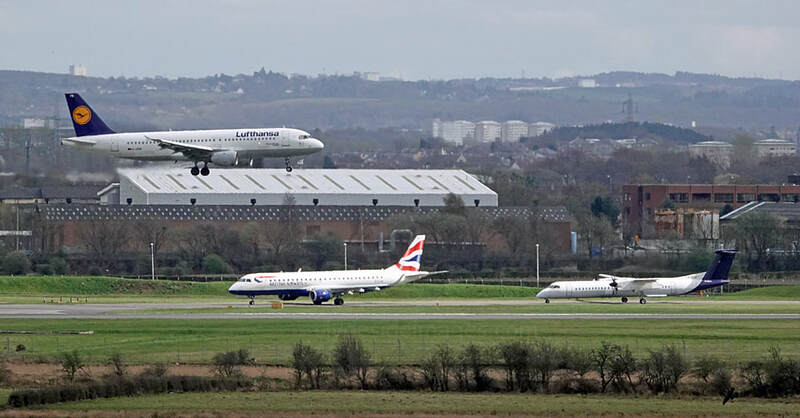 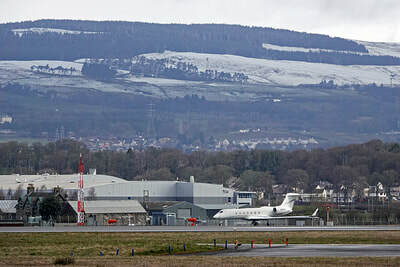 ​​The arrangements with Air France, Dutch giants KLM and Thomas Cook Airlines enable Loganair customers with flights connecting at Aberdeen, Edinburgh, Glasgow, Inverness and Norwich to purchase a `through-ticket’ and check-in baggage to their final destination. 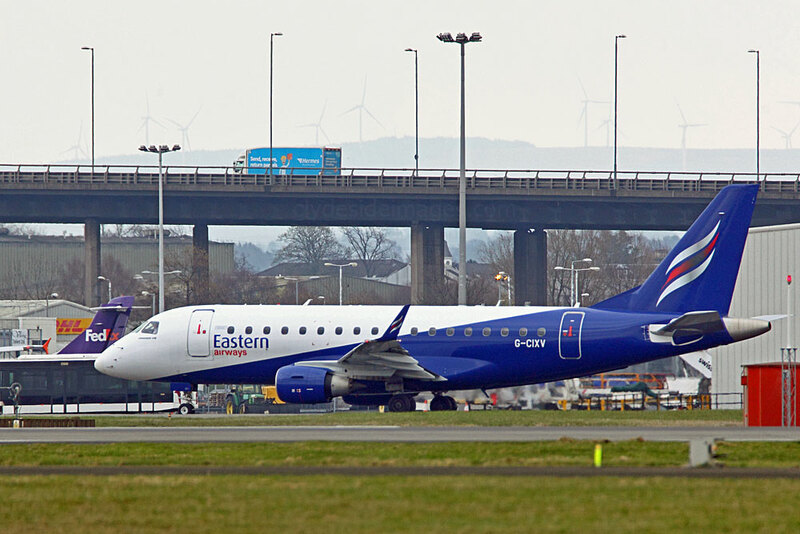 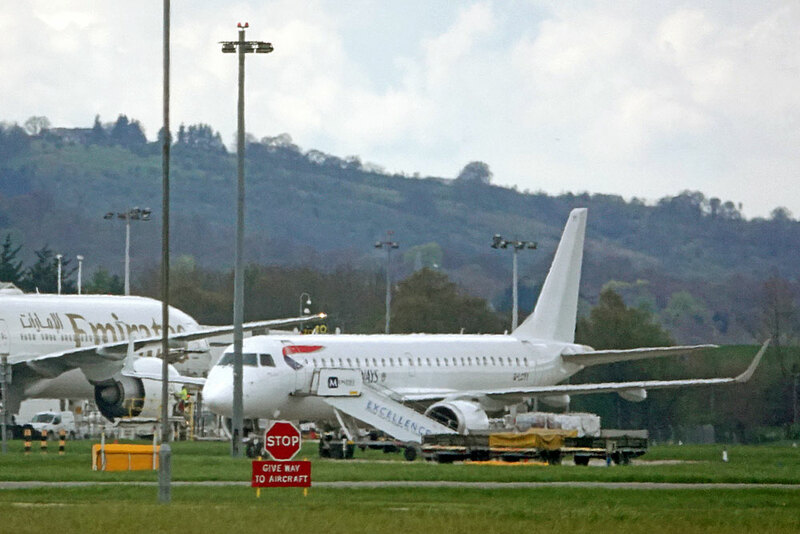 In addition to these deals, Loganair said it is close to signing agreements with Emirates and another three international airlines, which it will announce soon. 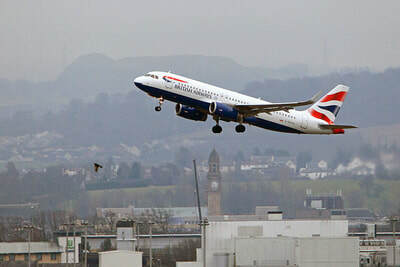 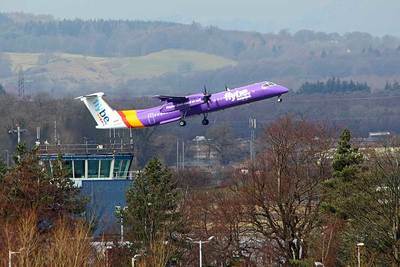 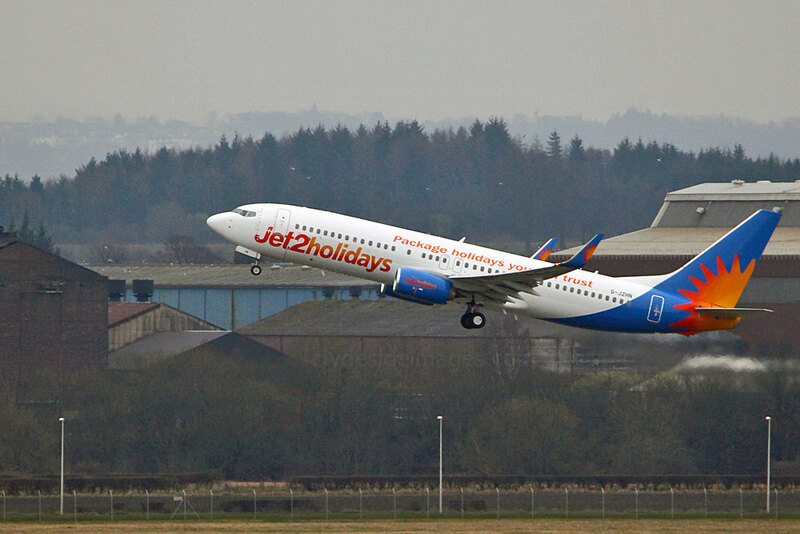 Single ticket booking for ongoing flights with more than one carrier offers multiple benefits, including through check-in, protected connections in the event of delays and, importantly, the air passenger duty saving on flights from the Highlands and Islands which can be as much as £78 per person if connecting onwards to long-haul destinations. 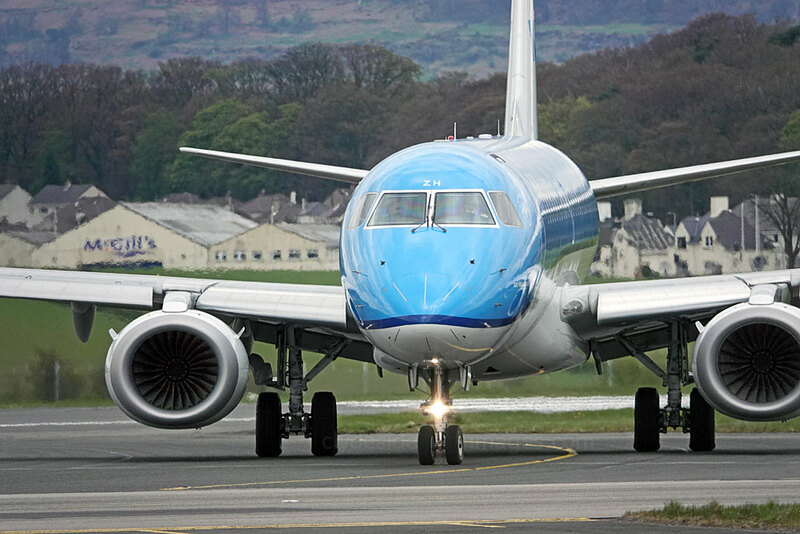 Passengers in the Highlands and Islands connecting with KLM and Air France will benefit greatly making it easier to reach worldwide destinations by transiting through Amsterdam Schiphol or Paris Charles de Gaulle. The arrangement with Thomas Cook Airlines will allow holiday connections from the Highlands and Islands via Glasgow to destinations including the USA, and both Eastern and the Western Mediterranean on a single ticket and the same will apply to Emirates services to the Middle East and thence to the Far East and Australia. The Thomas Cook partnership also provides long-haul connections from Inverness and Norwich via Manchester to destinations including New York, Los Angeles, Boston, San Francisco, Seattle, Orlando and Las Vegas on a single ticket. 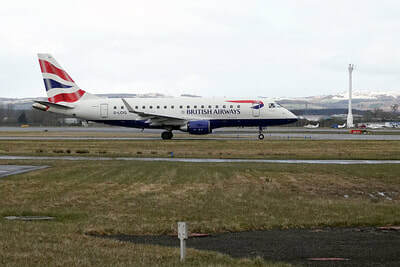 The latest interline agreement complements codeshare arrangements Loganair already has in place with British Airways and its partner airlines at Manchester, offering connectivity to transatlantic routes, including Chicago and Philadelphia, with onward connections throughout the US with British Airways’ partner airlines. 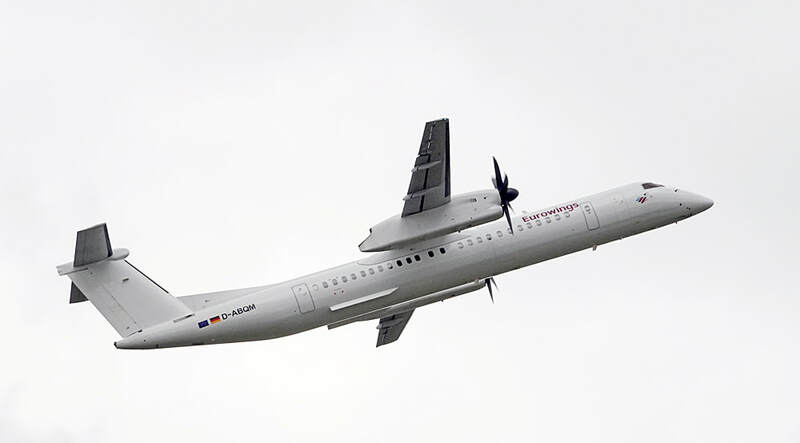 Eurowings Dash 8 D-ABQM heads back to Dusseldorf on 28 April. 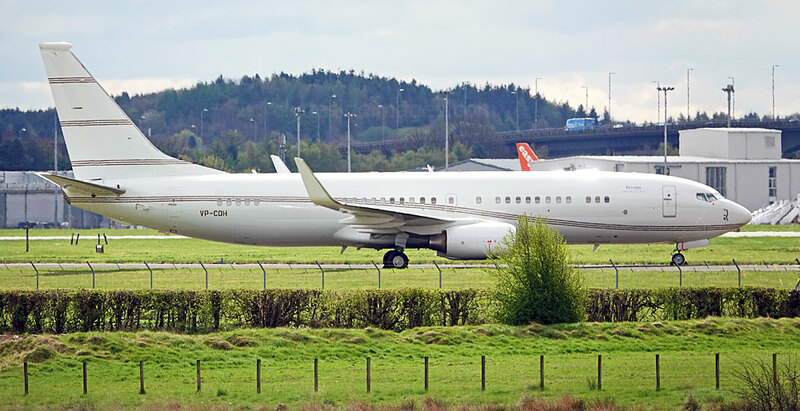 VIP Boeing 737-8DR(BBJ2) VP-COH (f/v) of PrivatAir Saudi Arabia arrived early evening on Friday 27 April and remained on Taxiway Y until 11:00 hrs on the 29th. 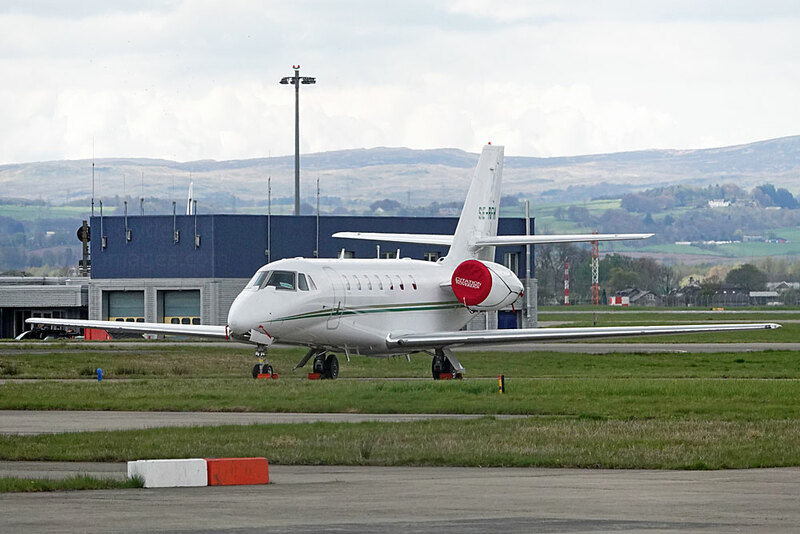 The Government of Monaco`s relatively new `taxi` Falcon 8X, registration 3A-MGA (f/v), arrived late on Sunday 8 April to park up here overnight. 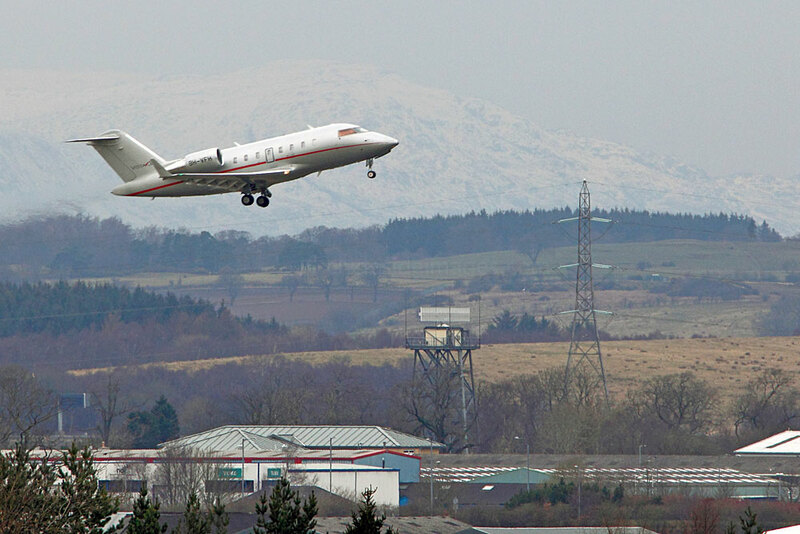 VistaJet Challenger 605 9H-VFH makes a steep climb out after lifting- off from Runway 05 on Friday 6 April. Gulfstream G550s N3788B (f/v) and VQ-BHP are seen here on Taxiway Yankee on the morning of the 18th. 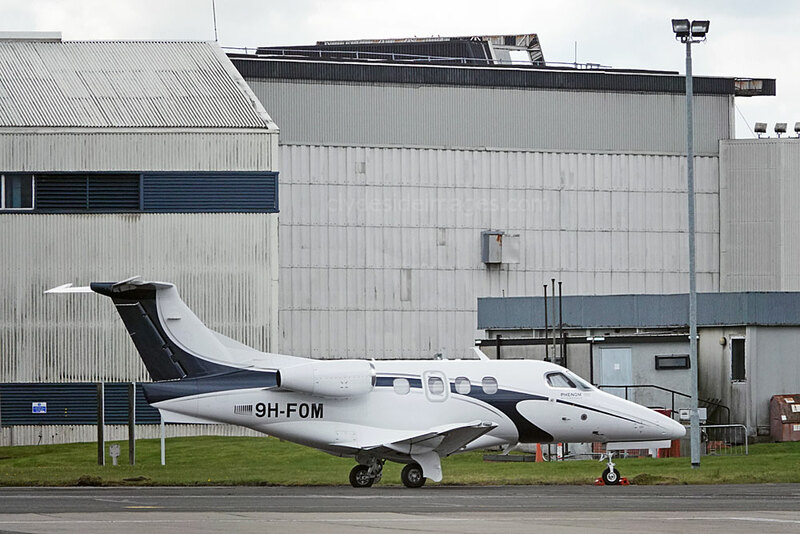 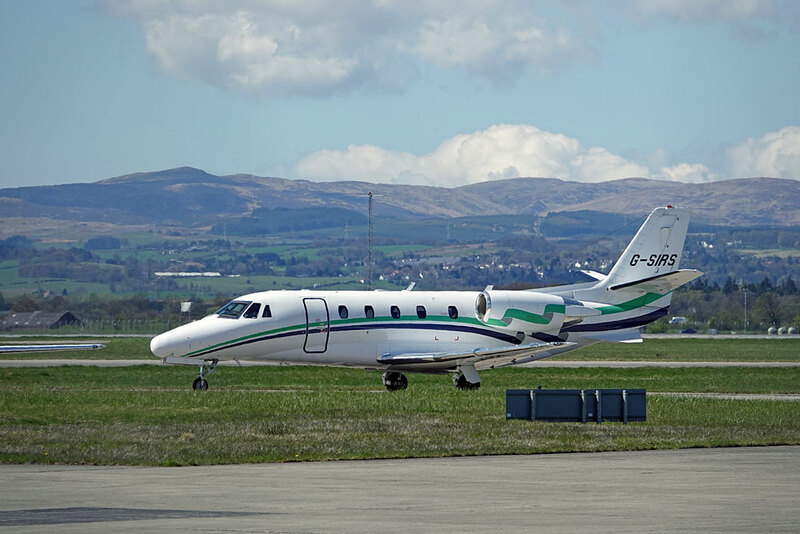 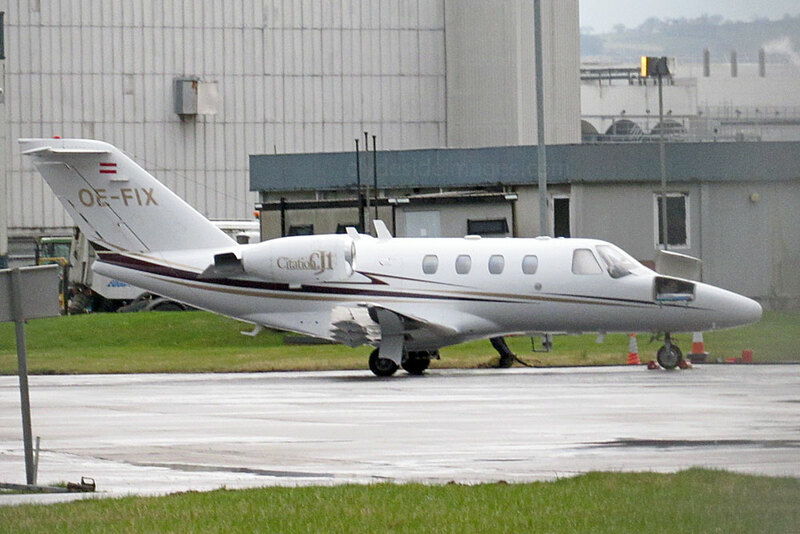 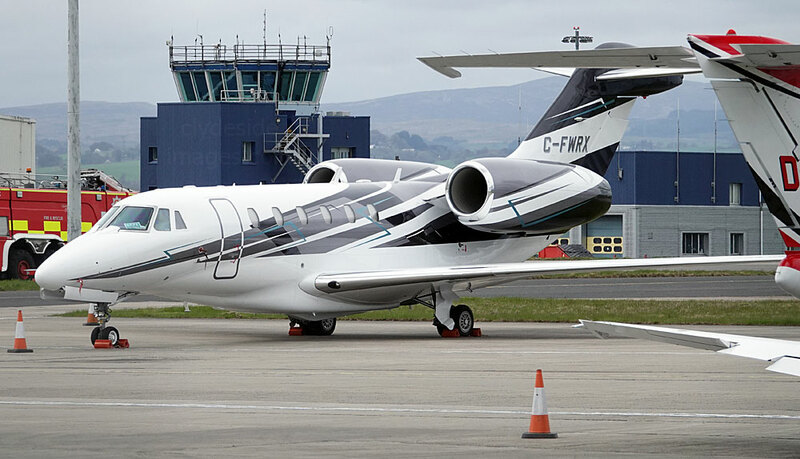 Embraer Phenom 300 D-CFHZ called in on Saturday 21 April 2018. 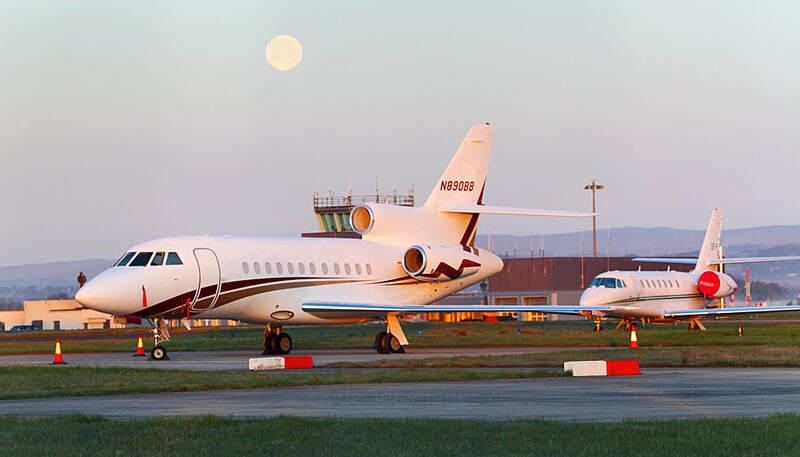 Learjet 41 I-FORR, plus Embraer Phenom 300s CS-PHB and G-JMBO (26th); ​Boeing 737-8DR(BBJ2) VP-COH PrivatAir Saudi Arabia (f/v), Gulfstream IV-SP N478GS and Learjet 40 9H-CFL (f/v) (27th); Falcon 900EX N890BB (f/v), Cessna 680 Citation Sovereign SE-RFH and Embraer Phenom 100 9H-FOM (28th); ​CitationJet CJ2 D-IKBO (f/v), Citation XLS+ D-CAHO, Embraer Phenom 300 G-JMBO, Phenom 100 D-IAAW and Learjet 35A D-CCAA (29th); ​Cessna 750 C-FWRX (f/v), Cessna CitationJet CJ2 D-IAKN and Citation Excel G-SIRS (30th). 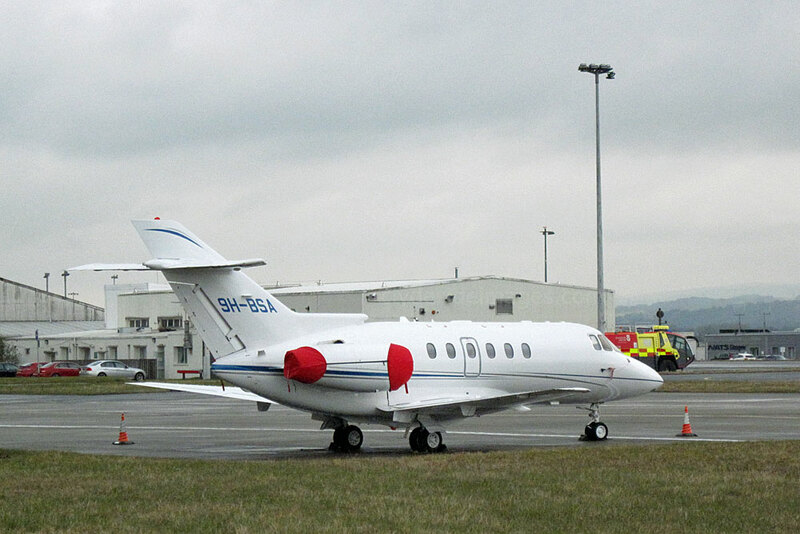 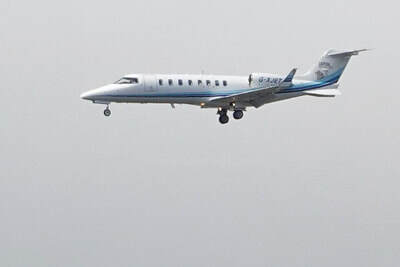 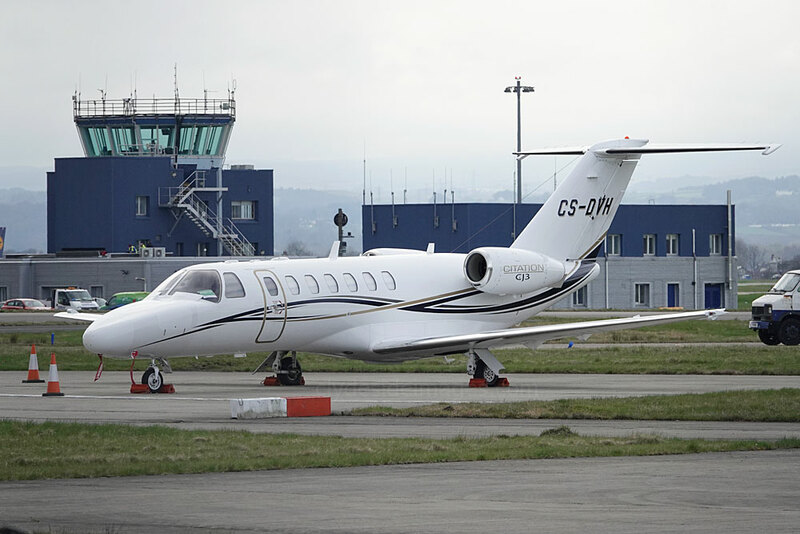 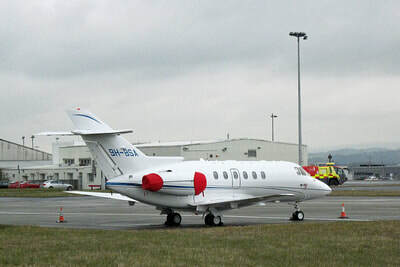 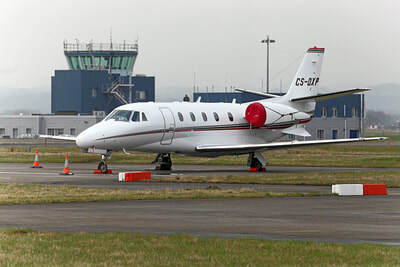 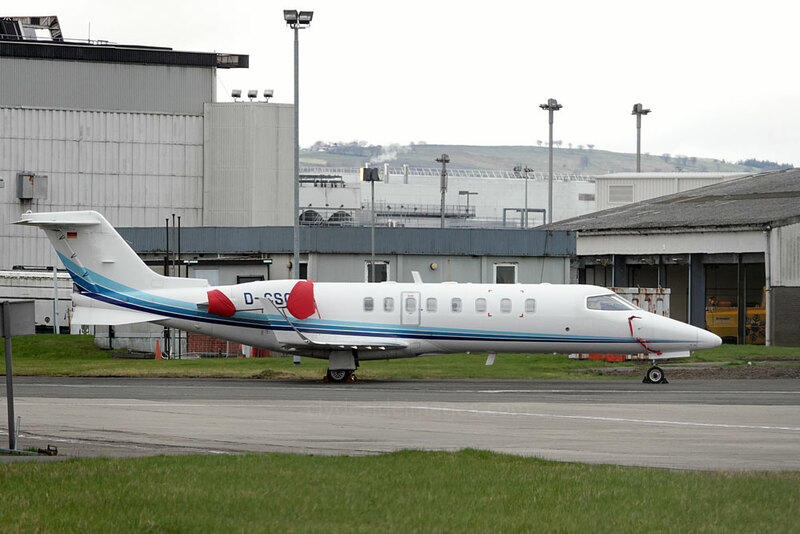 ​Belgian-registered Embraer Legacy 450 OO-NEY (f/v) arrived on April 19th. 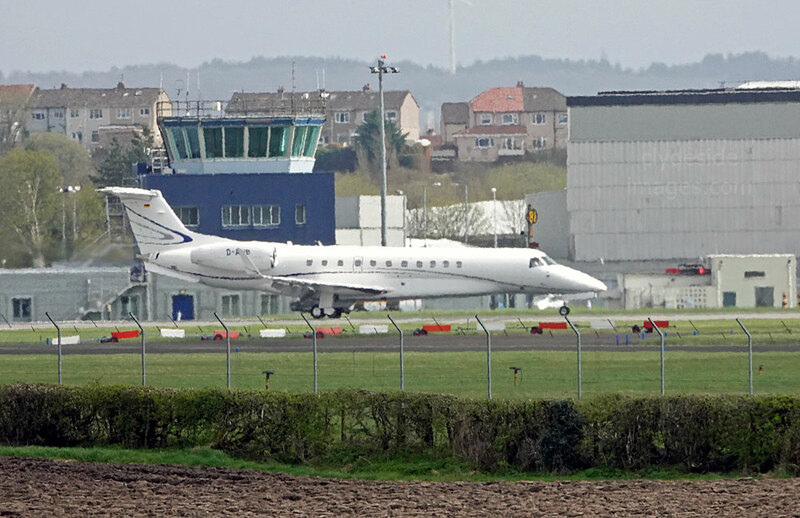 Above: Embraer EMB-135BJ Legacy 600 D-AVIB of Air Hamburg slows after landing on the 24th and ​Gulfstream V-SP N818LF, Taxiway Y, Thursday 5 April 2018. 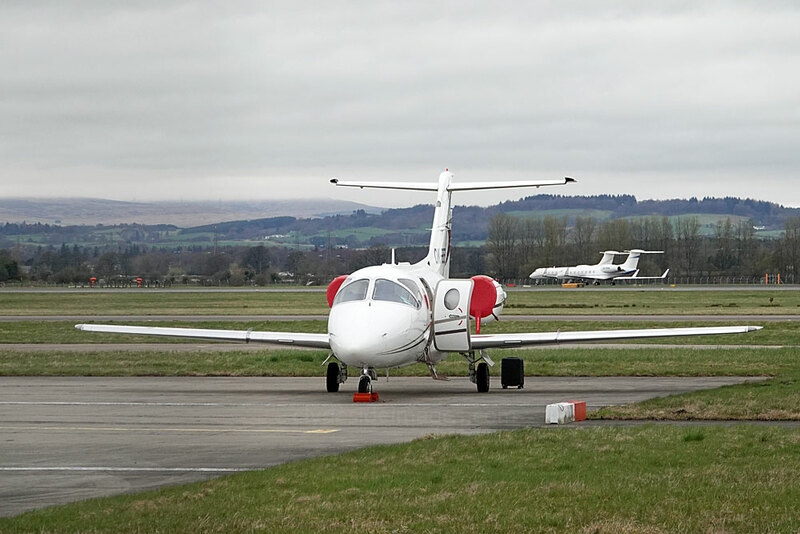 Learjet 35A D-CCAA, Area Juliet, Monday 30 April 2018. 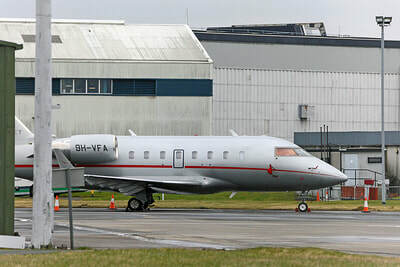 A Maltese Falcon would have been better, but I had to settle for a Maltese Learjet; 9H-CFL (f/v) was snapped on the 27th. 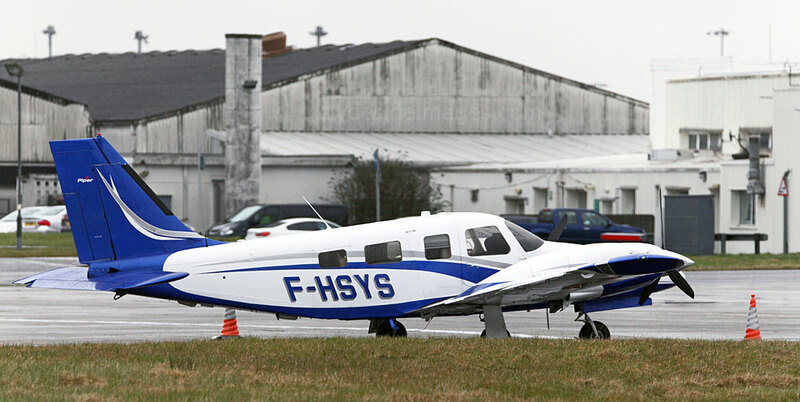 One of just a couple of foreign registered GA planes to call-in this month, French PA-34 Seneca F-HSYS visited on the 13th. 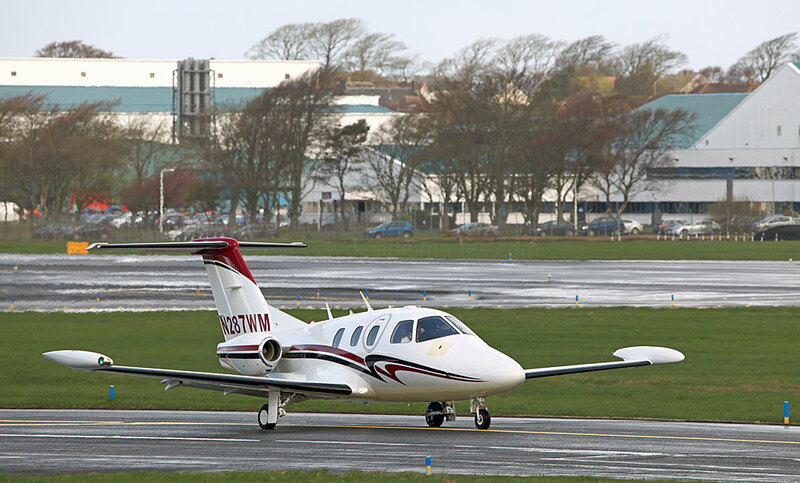 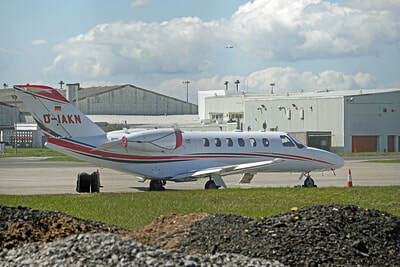 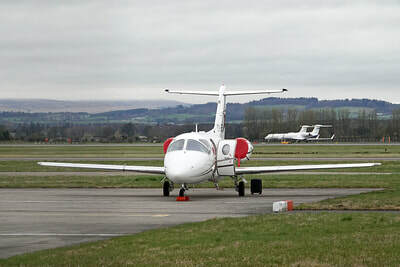 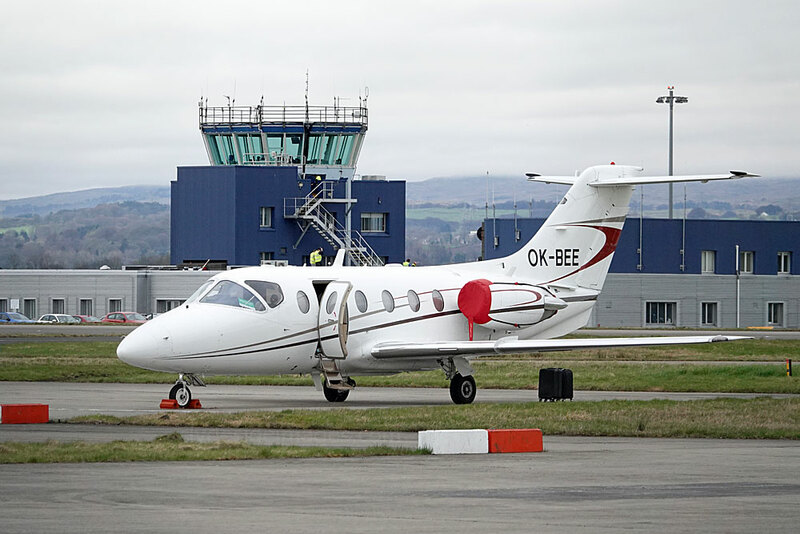 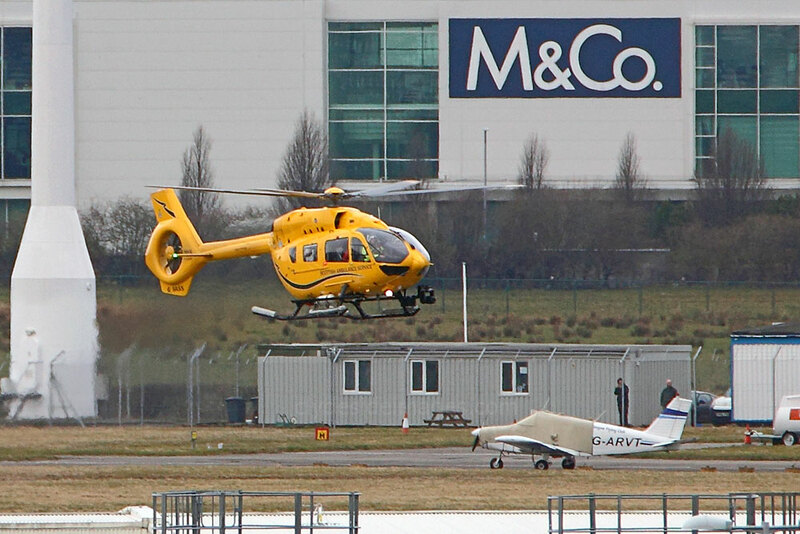 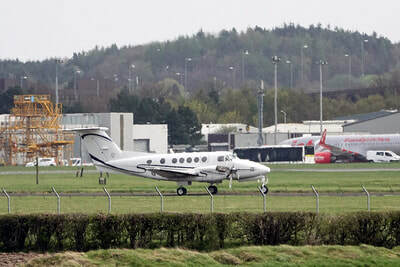 ​​Pilatus PC-12 G-KARE, plus Bell 206B Jet Ranger III G-XBOX (right)was operating pleasure flights from Bishopton and overflew the airfield or the `23` approach several times (28th); ​King Air G-FLYK returned, plus HM Coastguard AW189 G-MCGT (29th); ​King Air 200 G-FLYW and Cirrus SR22 N150ZZ (30th). 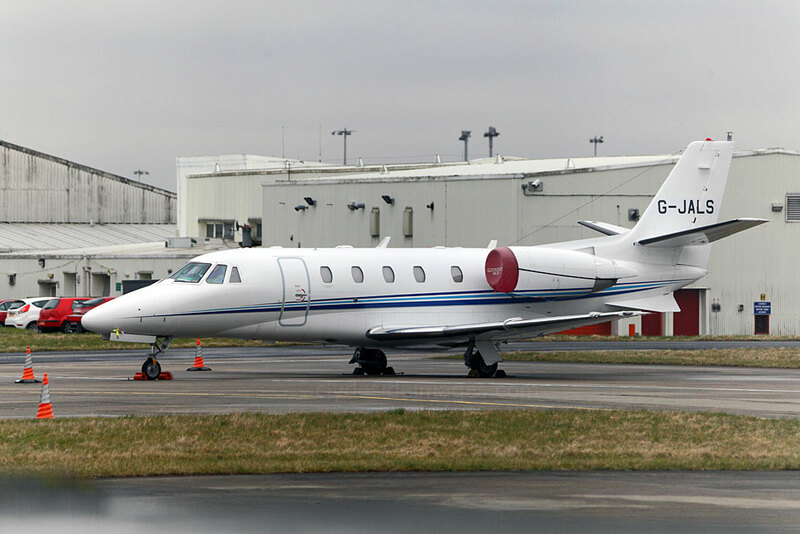 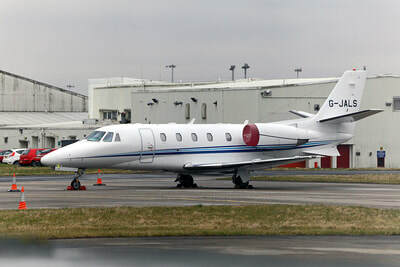 On 2 April, Easter Monday, Dassault Falcon 20 F-GPAA of AVDEF (Aviation Defense Service) made a two-hour stop around lunchtime. 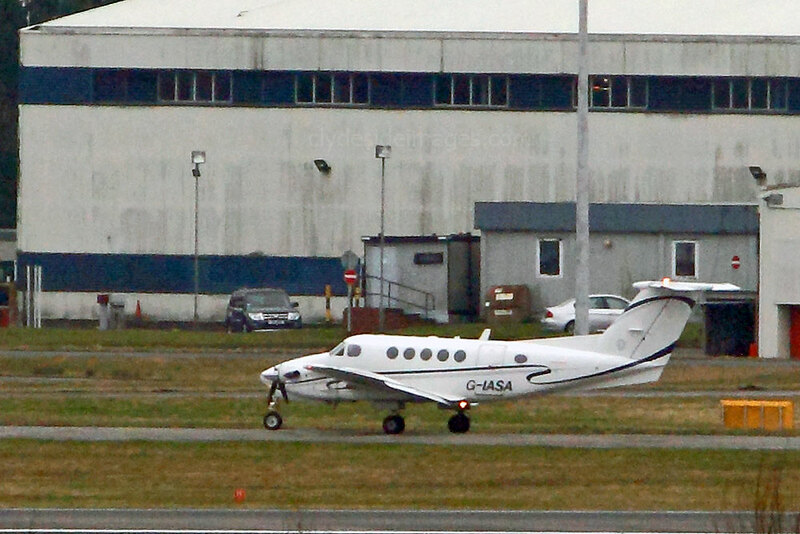 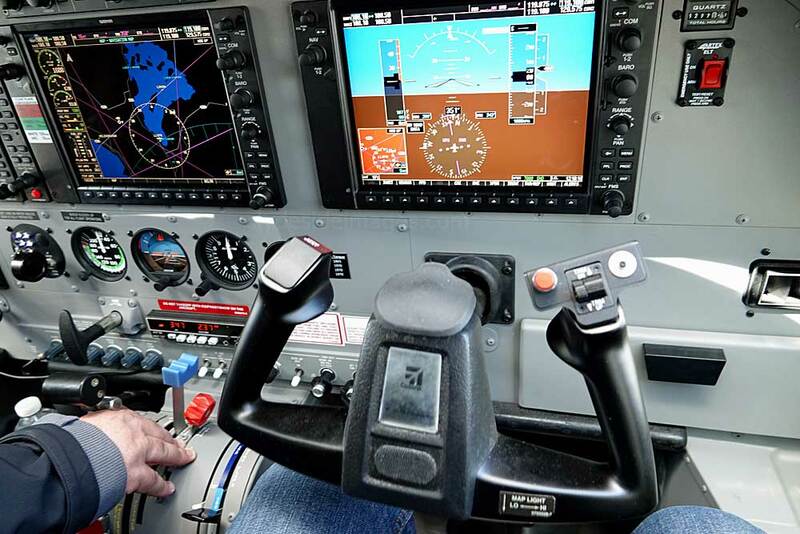 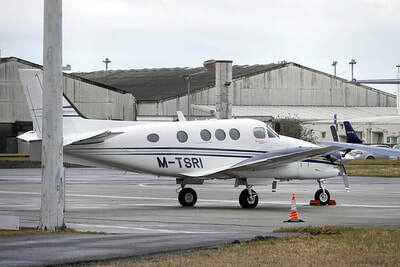 This company, which also has the Cessna F.406 Caravan II and Jetstream 41 on its inventory, undertakes work some of which is similar to that done by Cobham, flying missions with electronic pods to simulate attacks / radar jamming on other air and naval assets. 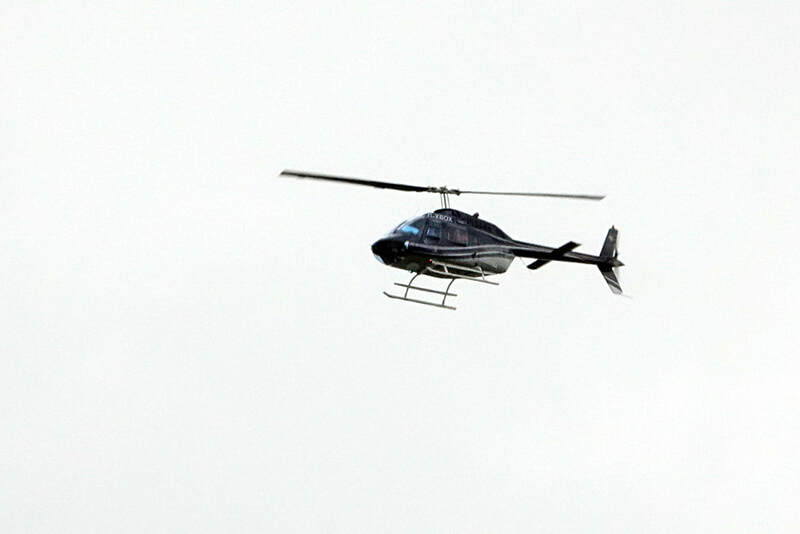 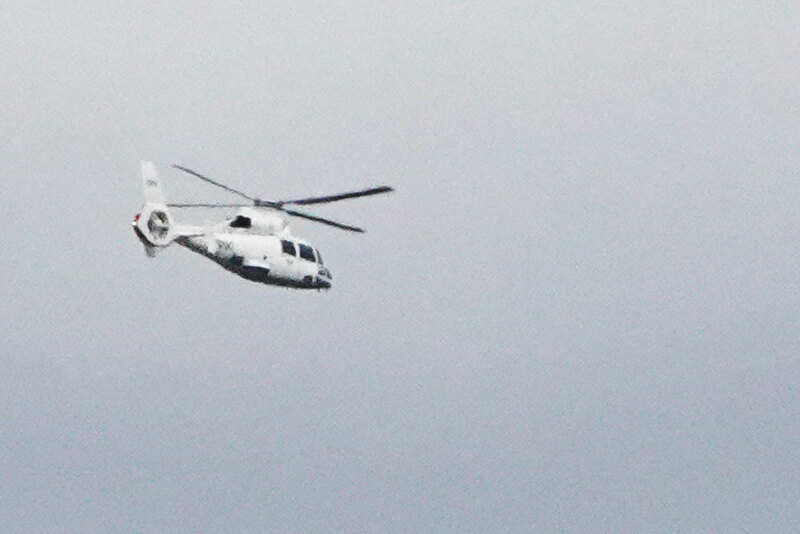 AVDef also offers target towing and aerial surveillance. 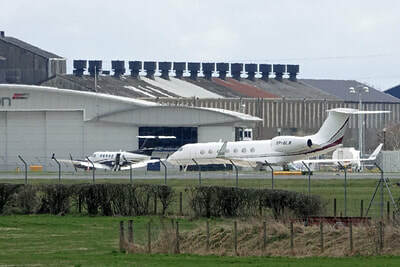 F-GPAA returned here on the 16th. 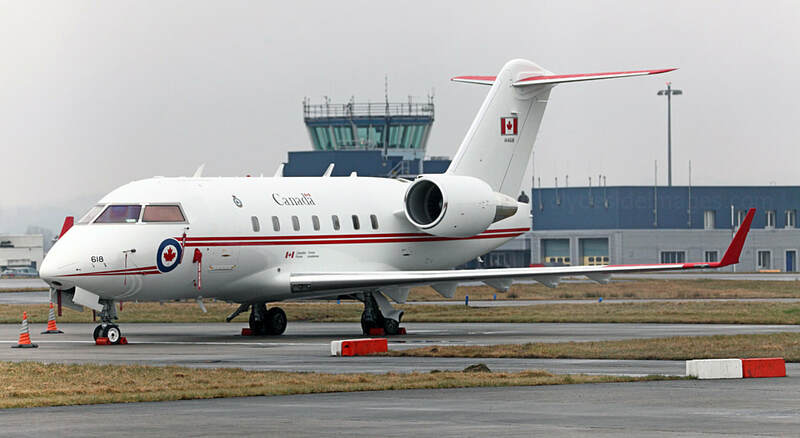 Canadair CC-144 Challenger 144618 Canadian Air Force (f/v) arrived early evening on Saturday 7 April and remained until 11:00 hrs on the 10th. 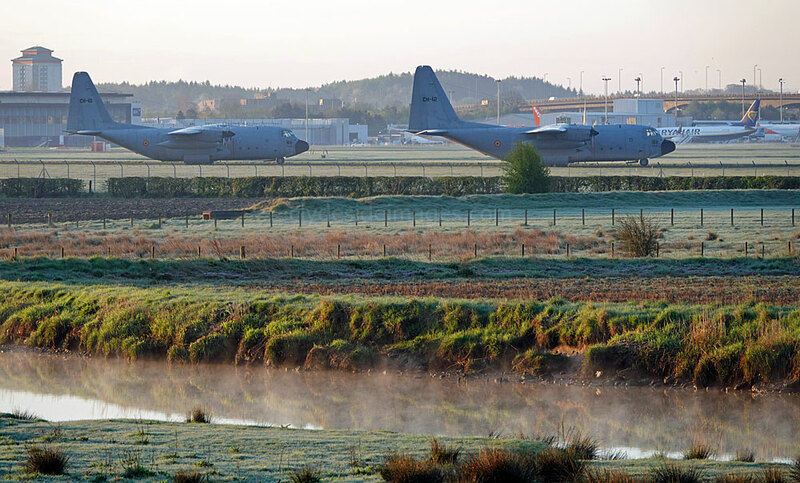 Royal Air Force Boeing C-17A Globemaster III ZZ178 dropped in during the early hours of Tuesday 10 April. 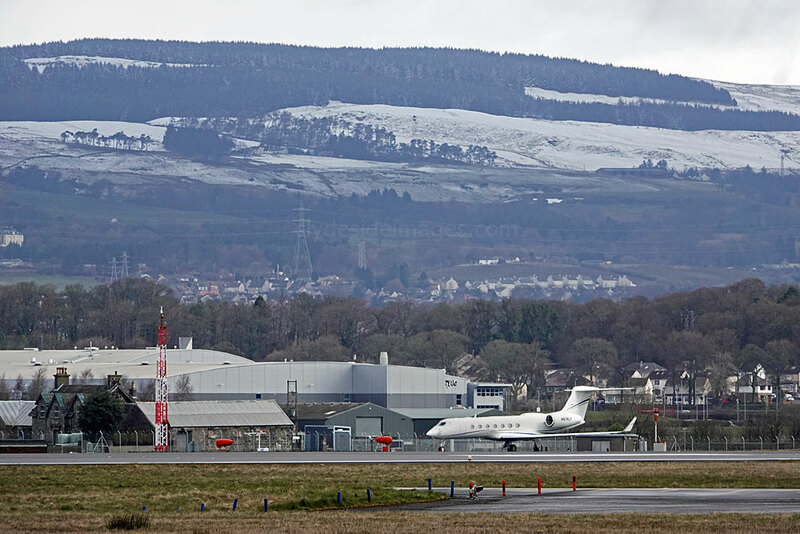 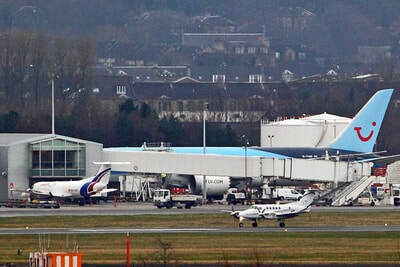 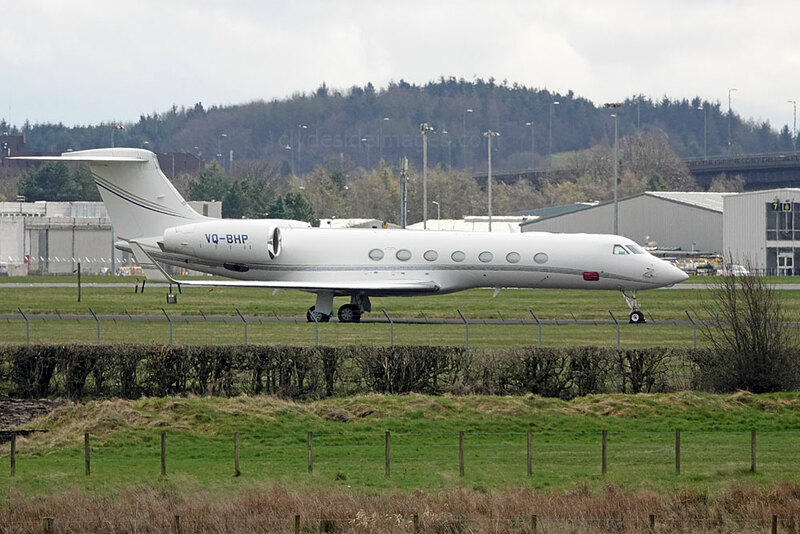 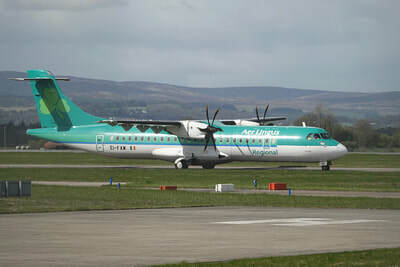 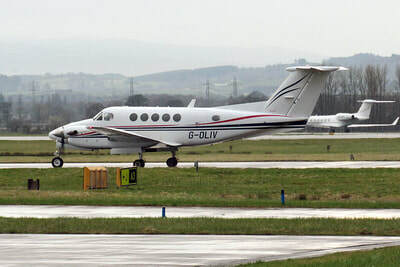 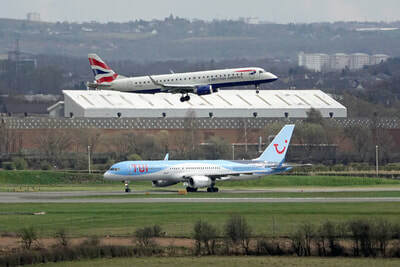 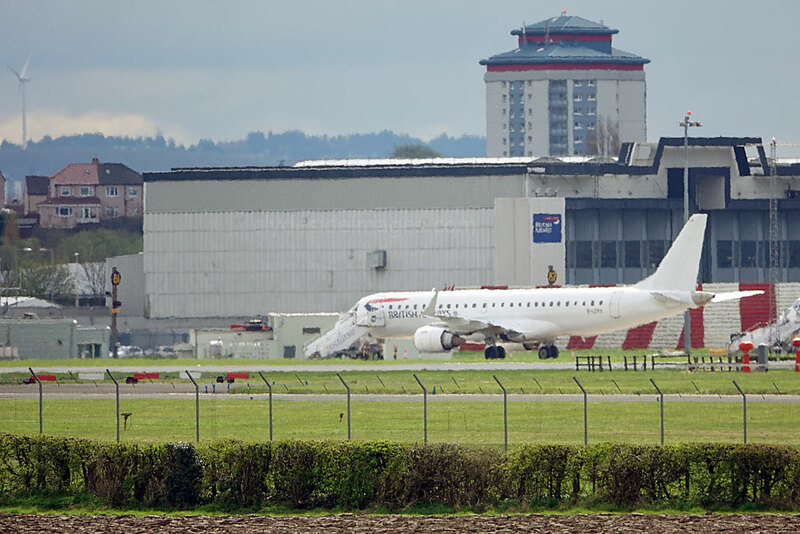 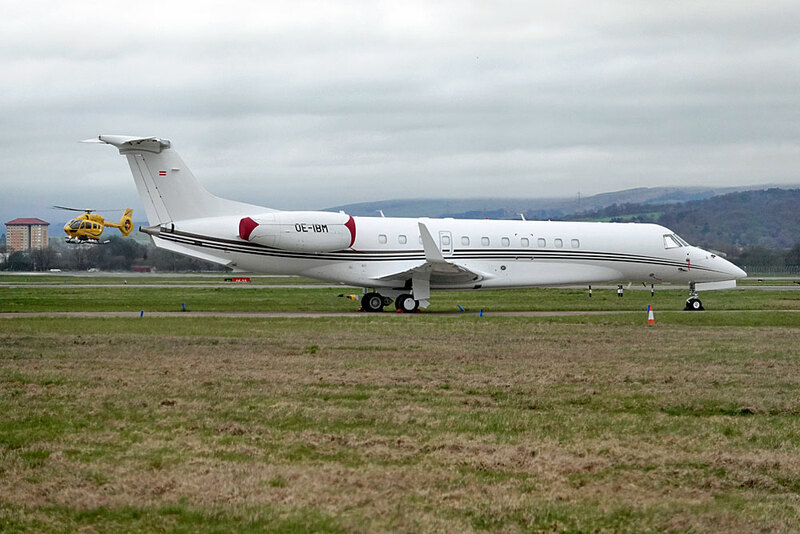 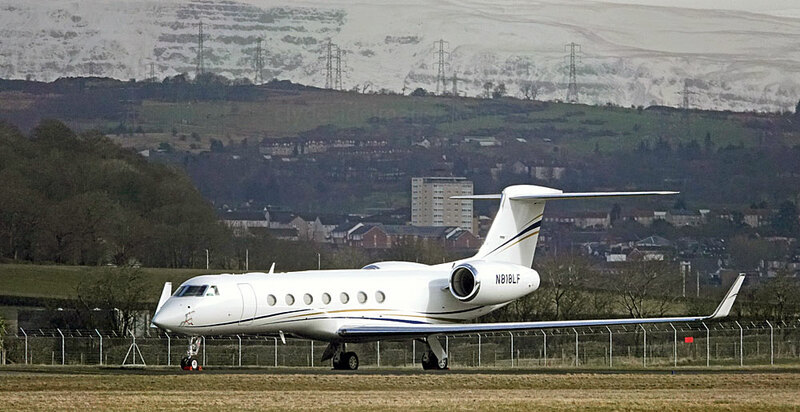 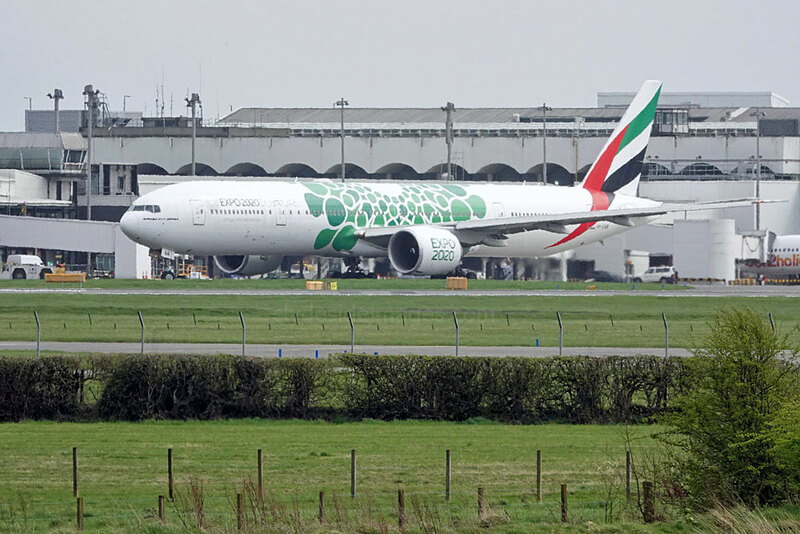 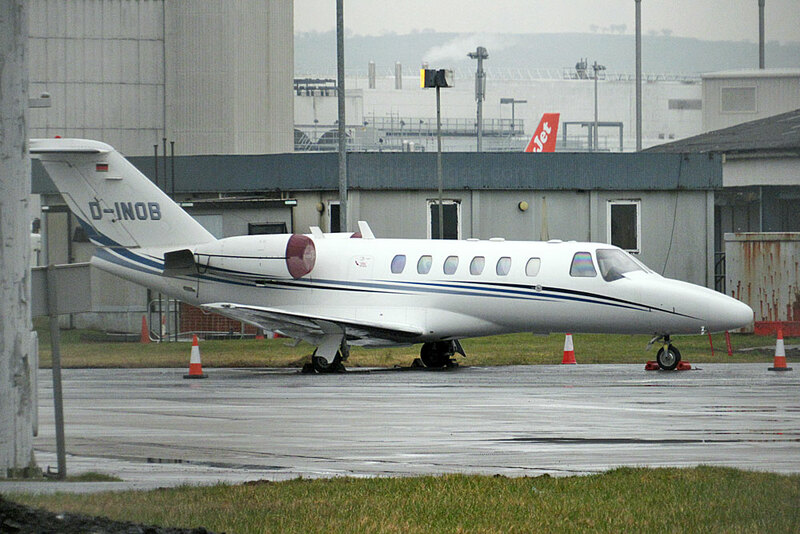 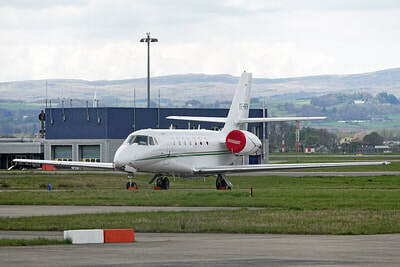 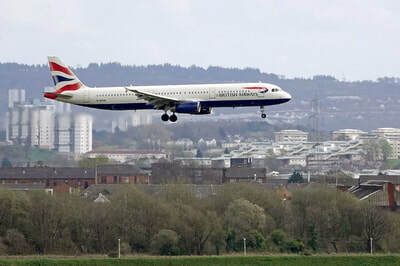 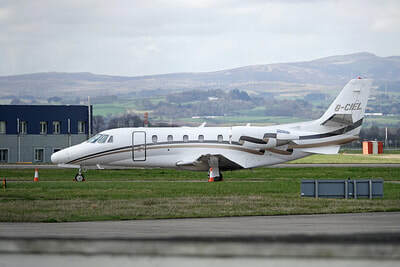 The aircraft, making its first visit to Glasgow International, was on the ground at Stand 39 between 02:35-03:35 hrs. 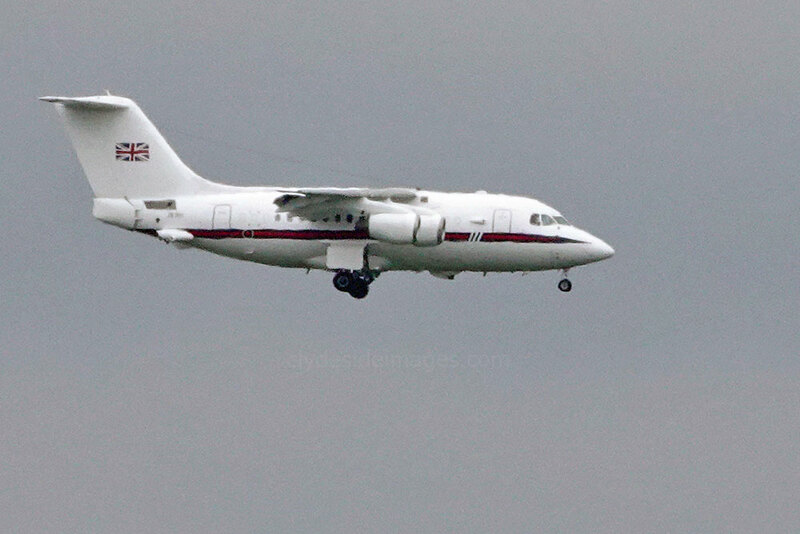 ​RAF BAe 146-100-CC.2 ZE701 (pictured) and C-27J Spartan MM62223 of the Italian Air Force both made afternoon visits on Thursday 19 April. 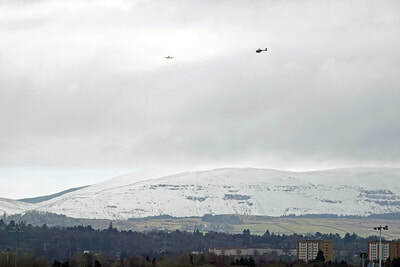 During the morning of Friday 20 April 2018, as the last of the vessels participating in 2018`s only Joint Warrior Exercise arrived on the Clyde, for a pre-event briefing, two USN Sikorsky MH-60S Seahawks 0168587 (f/v) "Navy American 04" and 166349 (f/v) "Navy American 06", called in at Glasgow. 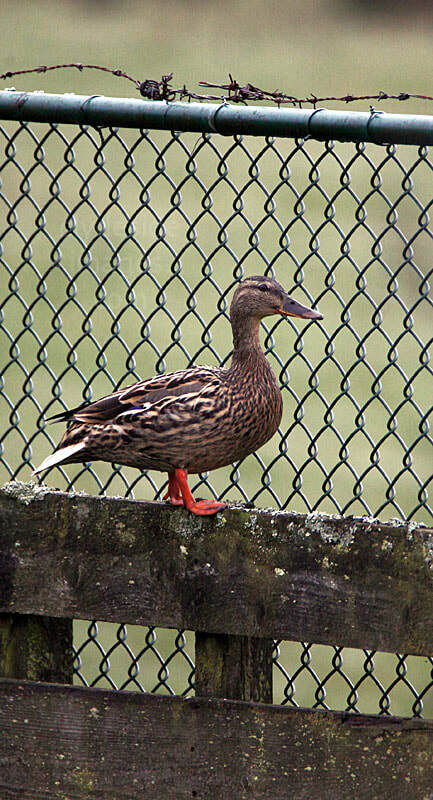 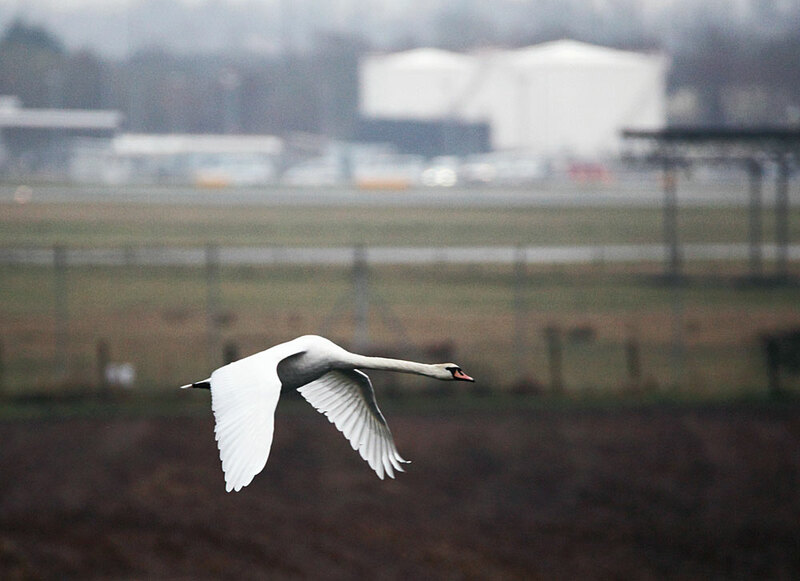 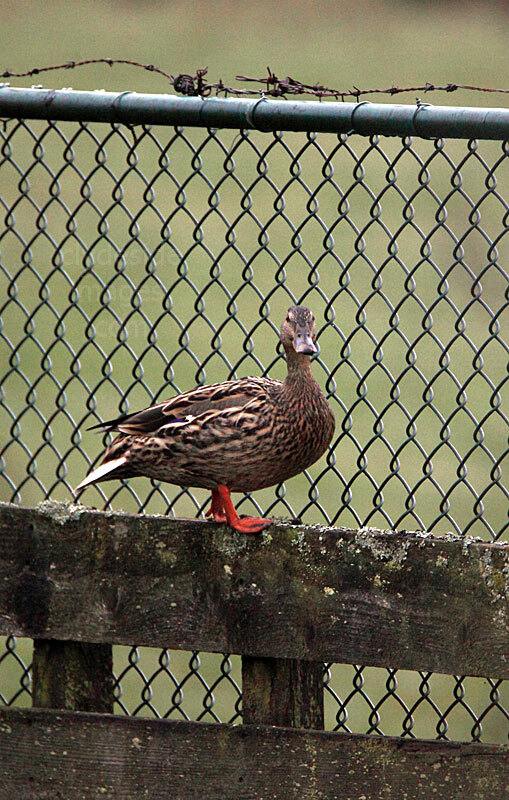 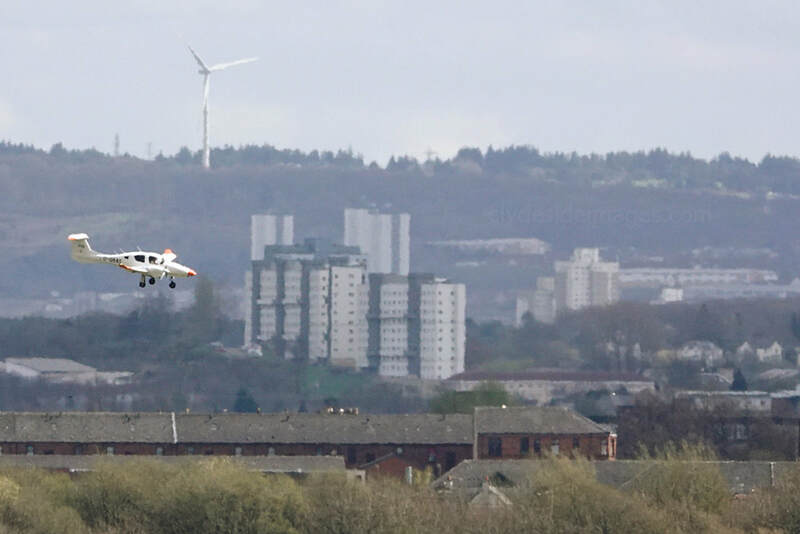 At least one headed for Aberdeen after take-off. 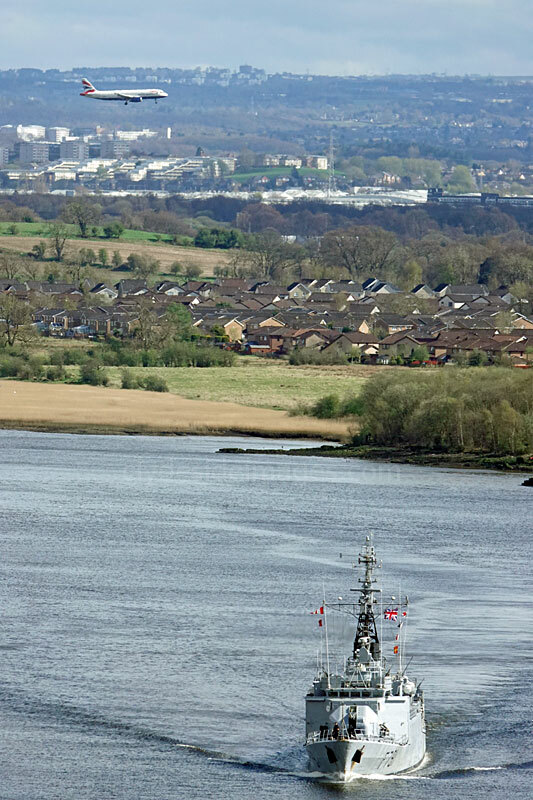 These two warships, heading for the Exercise Area, were snapped from the Erskine Bridge, late afternoon on Sunday 22 April. 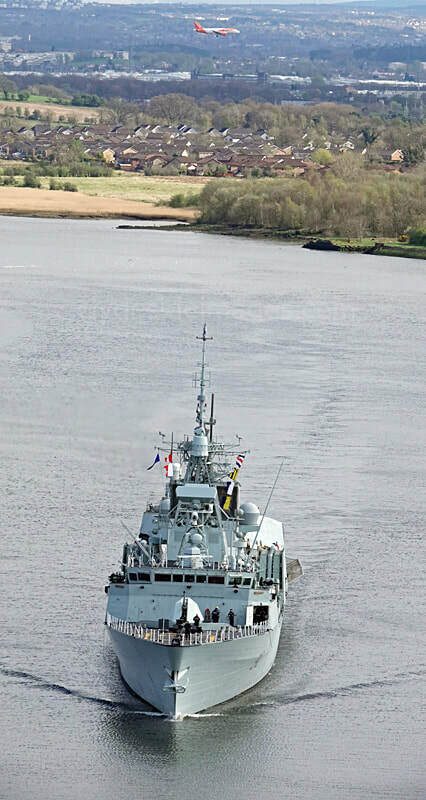 The first is Halifax-class Frigate HMCS St Johns. 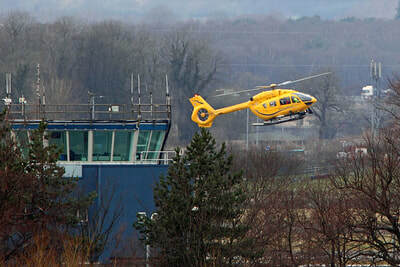 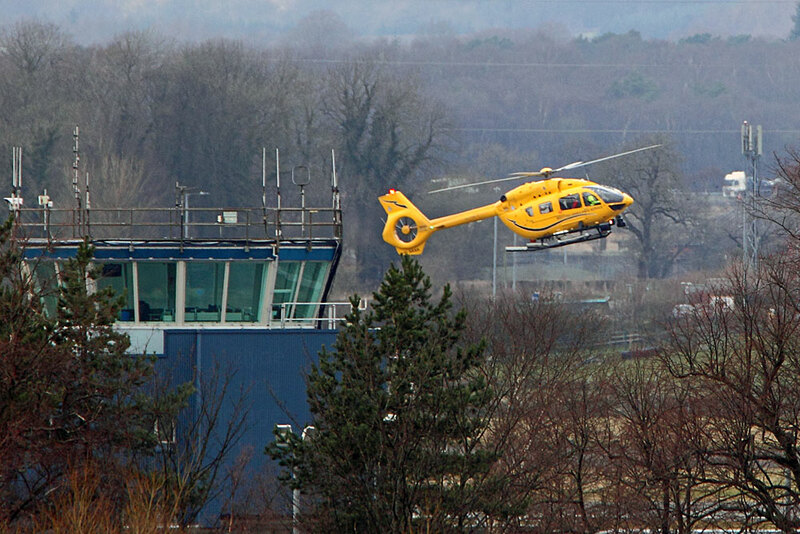 Her CH-124 (Sea King) helicopter, serial number 12412, made several visits to Glasgow International on the 29th. 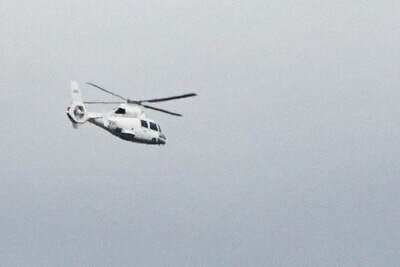 The other vessel is D'Estienne d'Orves-class Offshore Patrol Vessel (OPV) FS Commandant L'Herminier (F791). 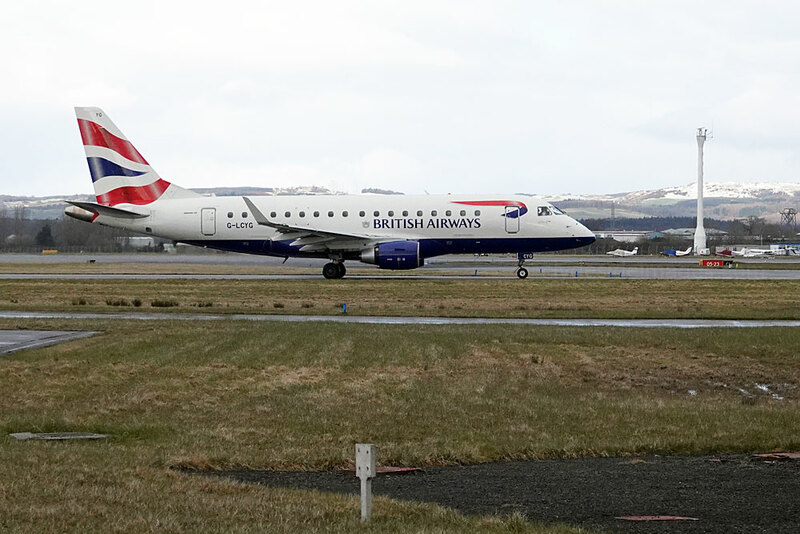 Sometimes larger aircraft conveniently appear in the background while ships are in view here but I had to settle for easyJet and BA Airbuses on this occasion. 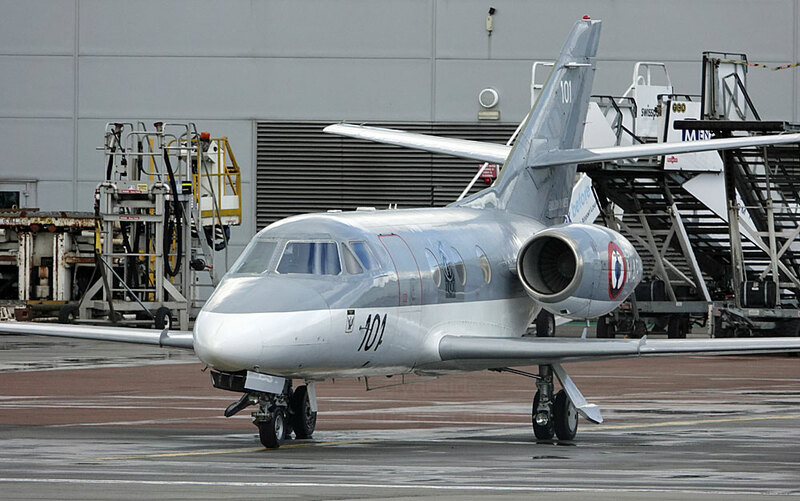 ​Dassault Falcon 10MER, serial number 101, one of seven of this type operated by the Marine Nationale (French Navy) called in during the afternoon of Thursday 26 April. This particular aircraft has been in service since February 1978. 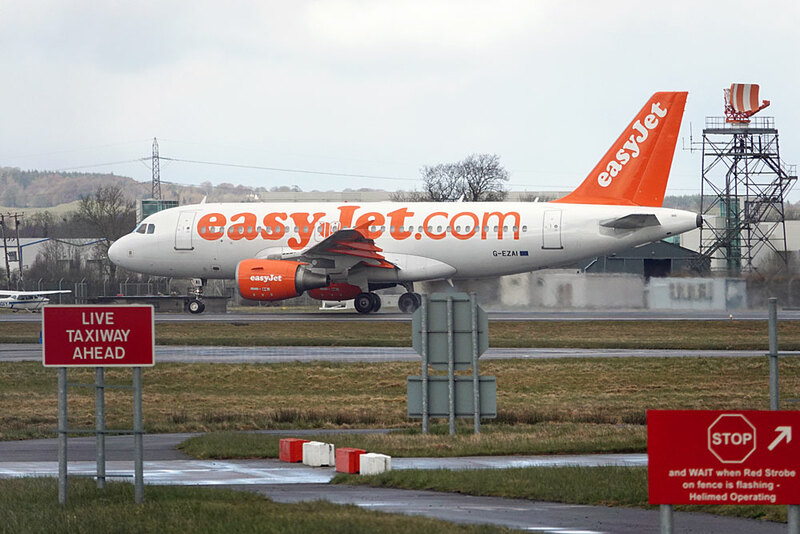 After dropping off passengers at the terminal (Stand 36) it taxied to the executive ramp and night-stopped, departing just after midday on Friday. 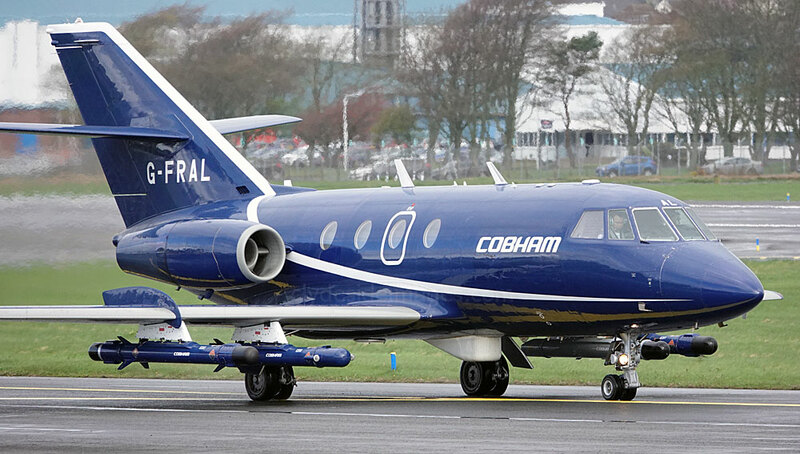 As well as liaison and VIP transport duties, the French Navy`s Falcon 10s can perform missions to the Cobham Falcons, overflying warships to control and calibrate the vessels` radars and firing systems and well as performing simulated strike missions on elements of the surface fleet. 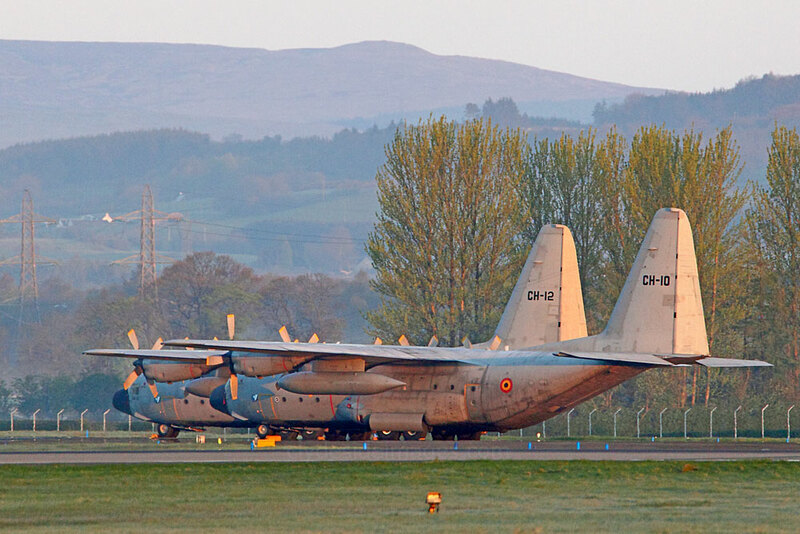 ​A pair of Belgian Air Force C-130Hs arrived about 12:30hrs on Sunday 29 April. 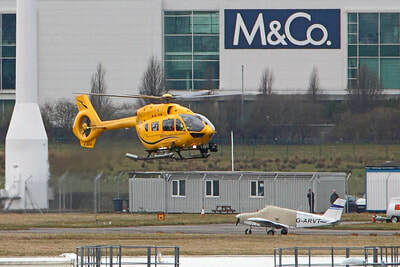 Bearing the serial numbers CH-10 and CH-12, both were visiting Glasgow for the first time and night-stopped on Taxiway Y where they remained until the morning of 1 May. 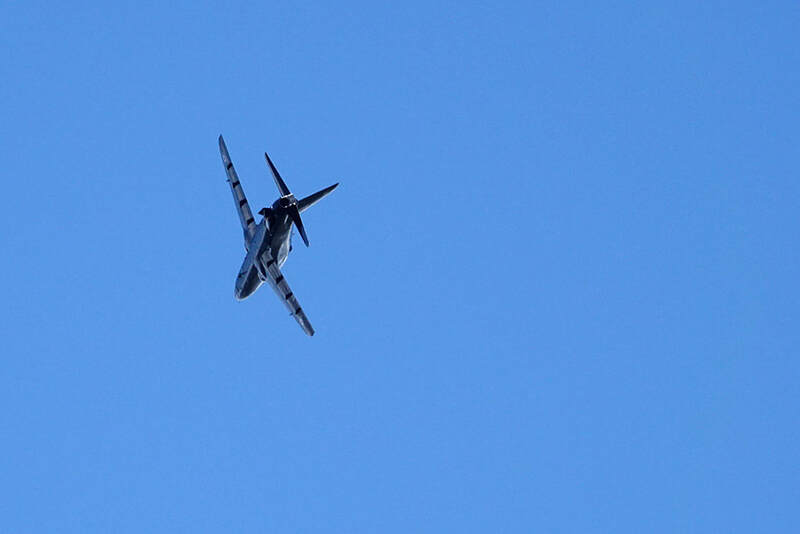 ​As previously mentioned, Canadian Forces CH-124 12412 (f/v) from HMCS St Johns made three visits during the day, apparently practising ILS approaches. 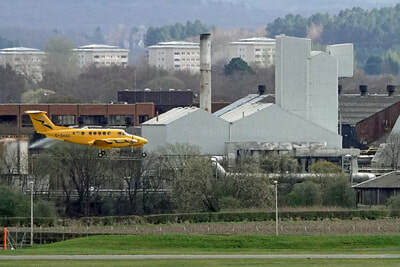 Just 5 minutes after the following shot was taken I couldn`t see the aircraft from the same spot due to a thick veil of mist rising from the Black Cart Water. 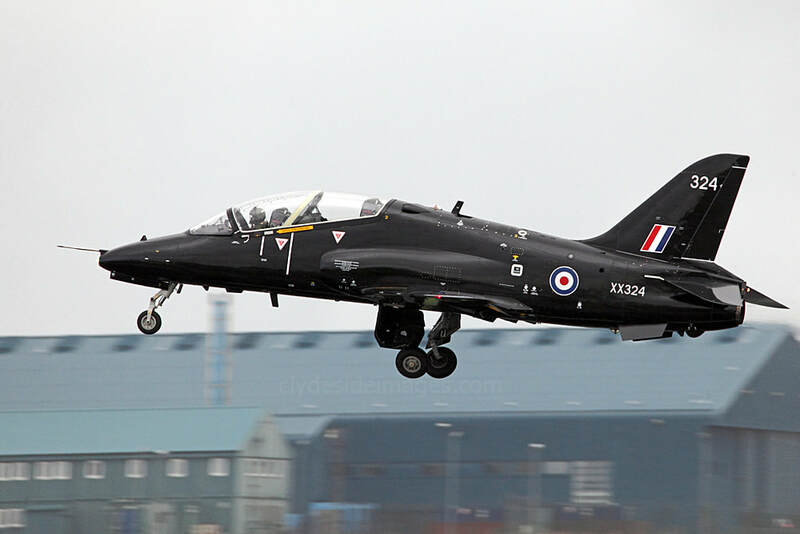 On Friday 26 April, I went down to Prestwick to photograph the Cobham Falcons and Royal Navy Hawks which were temporarily based there during Exercise Joint Warrior. 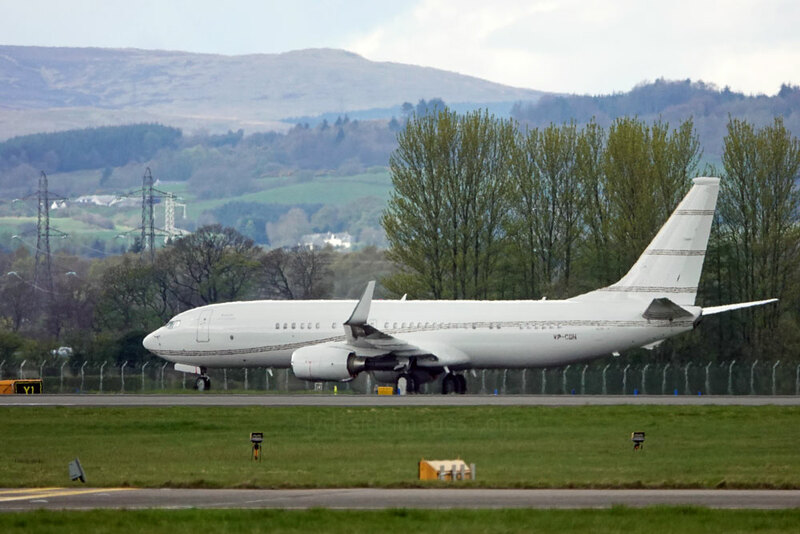 Traditionally, the UK hosts the event twice each year, in Spring and Autumn, however, due current political instabilities and military ​commitments across the globe, JW181 was the only one to take place in 2018. Things should be back to normal in 2019 though. Apart from the sorties flown by the Hawks and Falcon there wasn`t much activity, however, a Belgian Air Force Airbus A321-231 CS-TRJ was a surprise visitor and I caught night-stopping C-12??? 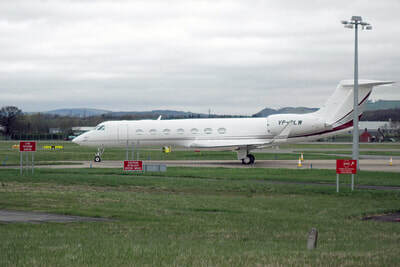 setting-off before I headed home. 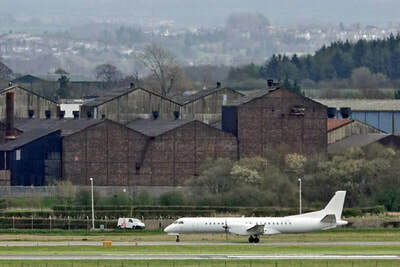 I`m not sure if the Airbus`s appearance was connected with the exercise as there was only one Belgian Navy vessel, BNS Narcis, a Minehunter taking part on this occasion. 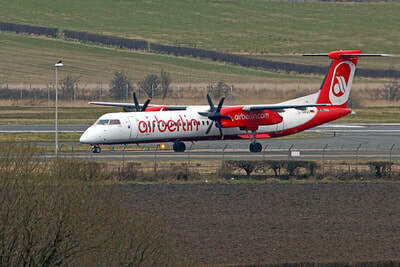 The civil-registered airliner is part of the Highfly Aero fleet. 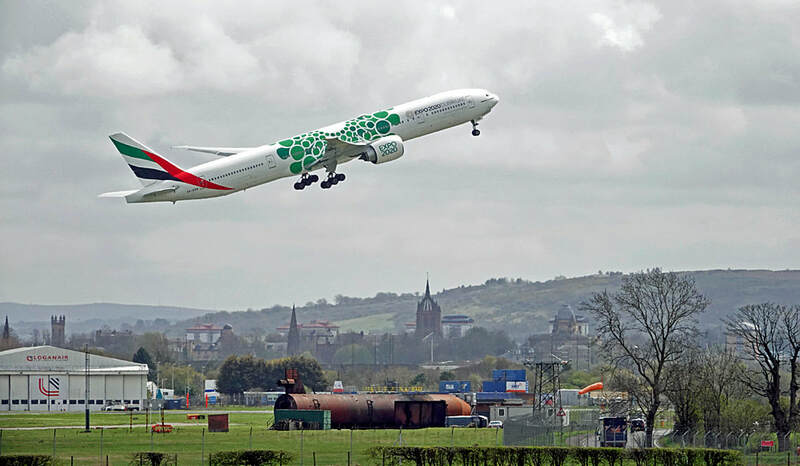 This Lisbon-based company specialise in wet leasing widebody A321s, A330s A340s and, more recently, the A380. 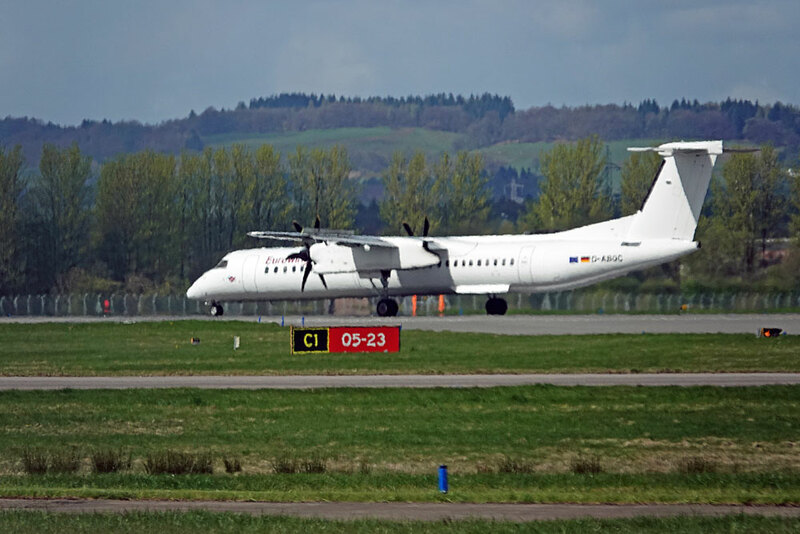 Wet Lease means that the package includes not only the actual aircraft but includes the supply of crew, maintenance and insurance. 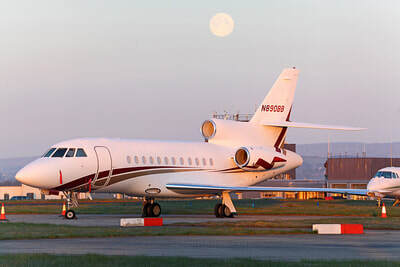 ​Aircraft are placed in short, medium or long term contracts mainly for major airlines and governments. USAF Hawker-Beechcraft MC-12W Liberty 09-0648 taxis for departure. 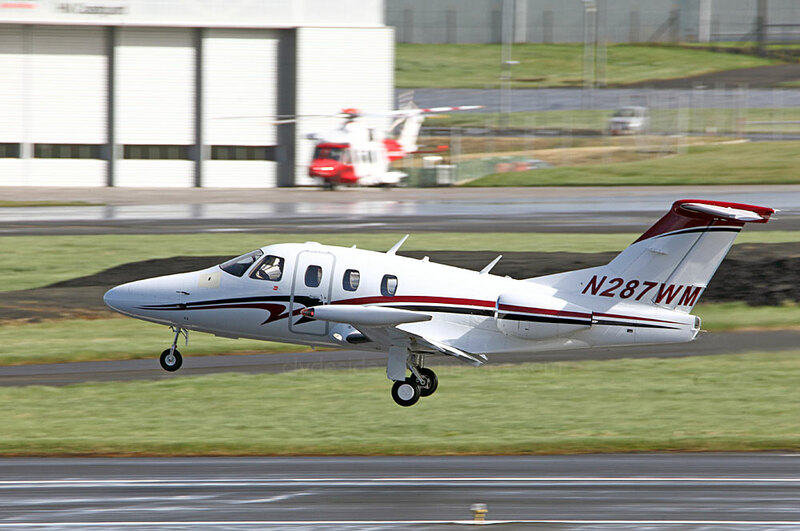 Eclipse Aviation EA500 N287WM is owned by Enertron Inc, a thermal management and engineering company with bases in the United States, Europe, Taiwan, and China. 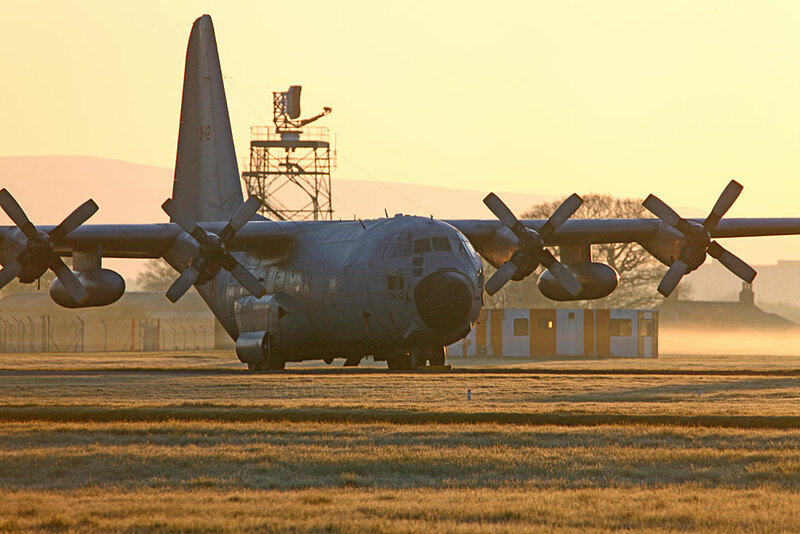 It designs and manufactures various components and provides thermal management solutions for the Aerospace, Military, Medical and Telecommunications industries amongst others. 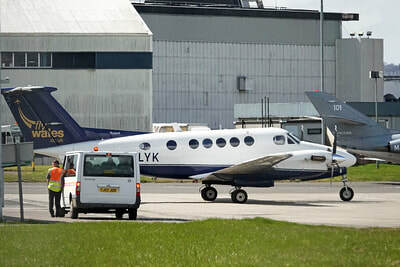 This aircraft, stripped down to its coat of primer and bearing the registration LY-VEW, was temporarily pulled out the hanger to be re-positioned. 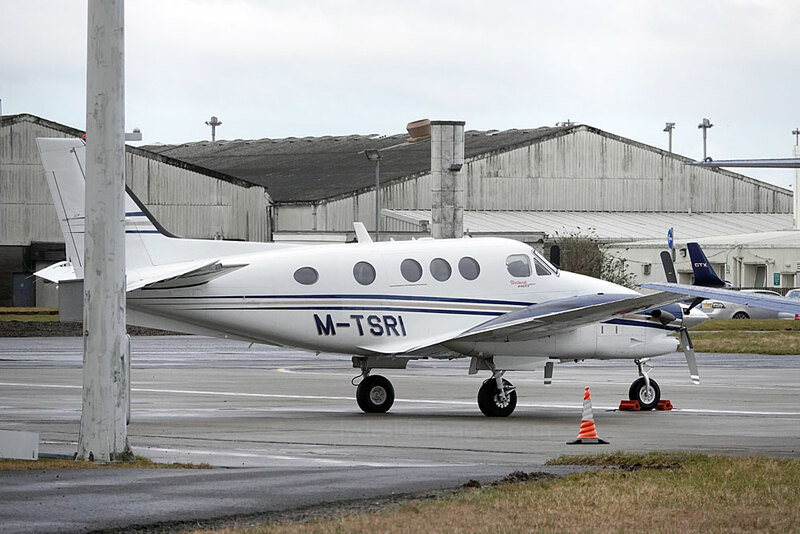 It`s part of the Avion Express fleet, a Lithuanian company that specialises in wet leasing and charters. 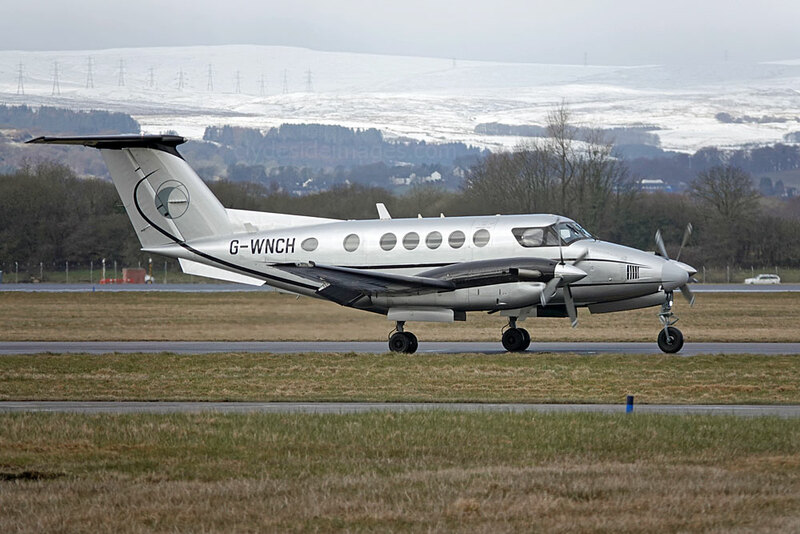 The ex-Monarch airliner was placed in storage at Prestwick after the British carrier went bust in October 2017. 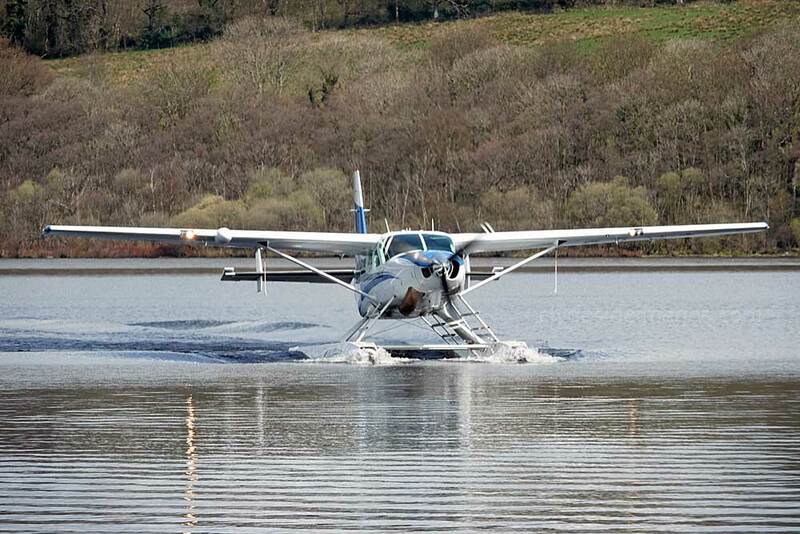 I was lucky enough to be given a voucher for a flight with Loch Lomond Seaplanes as a birthday gift and after having to cancel my first three booking dates due to high winds, I finally took to the air towards the end of the month. 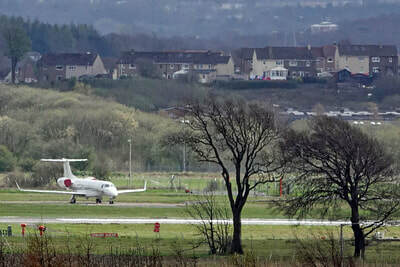 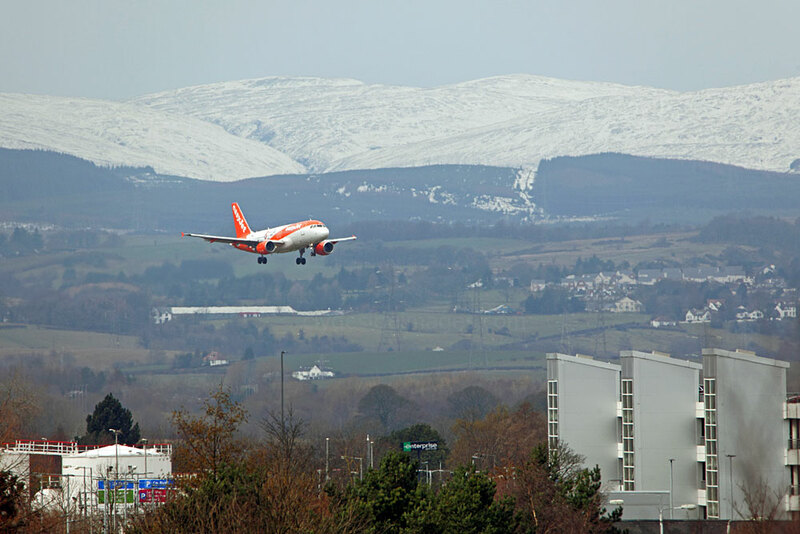 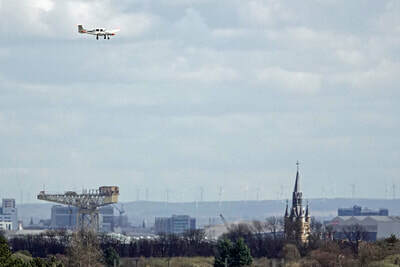 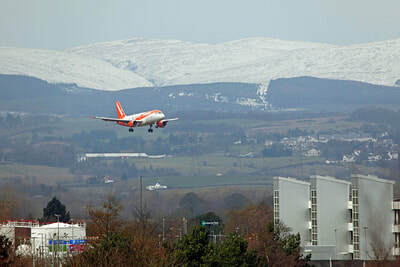 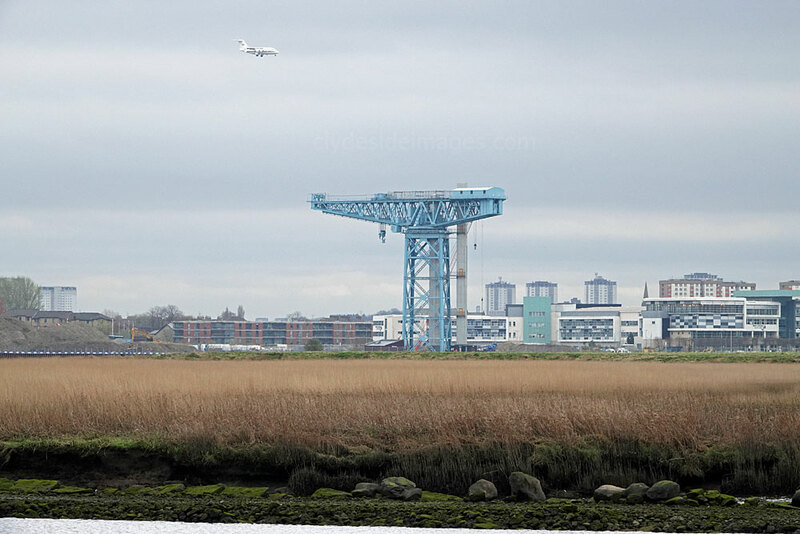 I had been in one of the operator`s planes once before, years ago, when they flew from Glasgow City Centre beside the Science Centre, but the weather was grey and overcast so the scenery, wasn`t at its best. 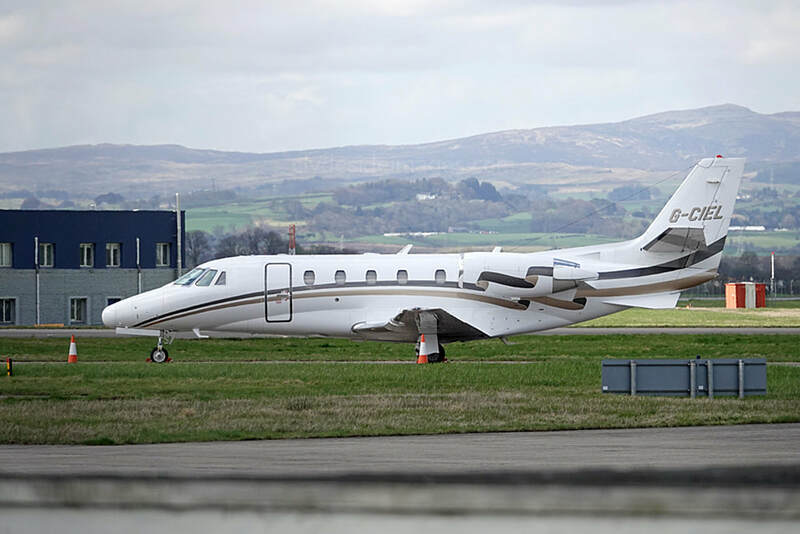 Now, the flights depart from the company`s small private jetty in front of the Cameron House Hotel on Loch Lomondside, a far nicer location, and even before the plane takes to the air passengers are surrounded by magnificent countryside. 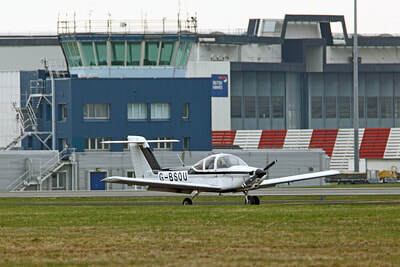 I was glad the previous dates had been cancelled as the weather for my afternoon flight was superb and I was allocated the seat beside the pilot! 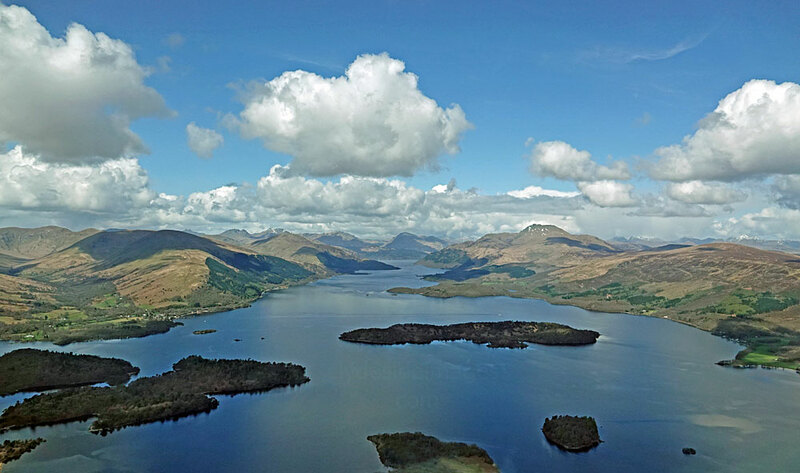 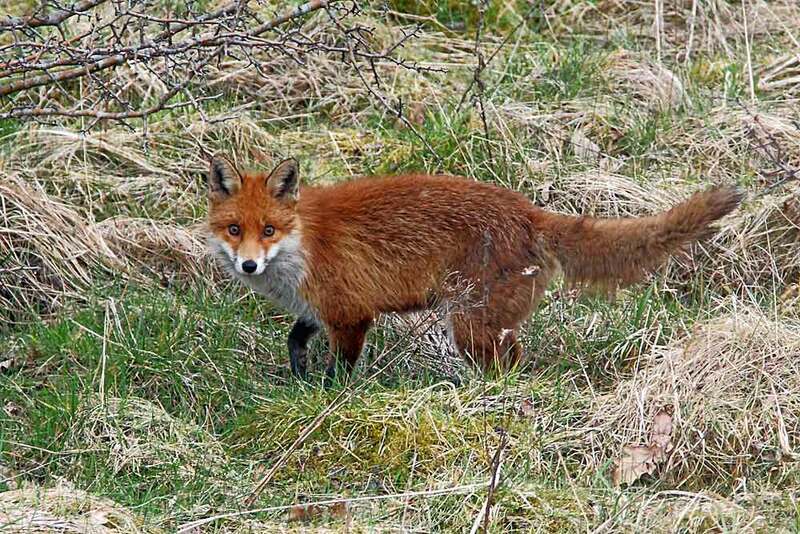 I was on the West Coast Explorer tour which, after a quick circuit above the southern end of the loch to let everyone see Ben Lomond, headed over the Luss Hills to the Kyles of Bute, taking in the Gare Loch and Loch Long en route. 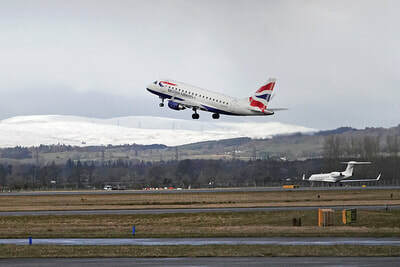 The pilot continued over the southern end of Loch Fyne, crossed the Kintyre peninsula at Tarbert and flew towards Jura (above) before the return leg which provided a panoramic view of the Firth of Clyde and Arran`s jagged peaks. 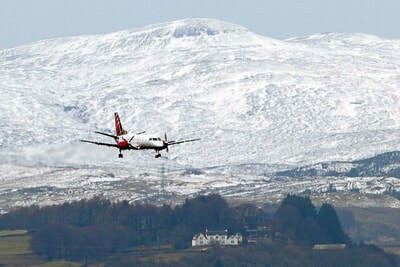 The Goatfell ridge and Lochranza Bay at the north end of the island are pictured below. 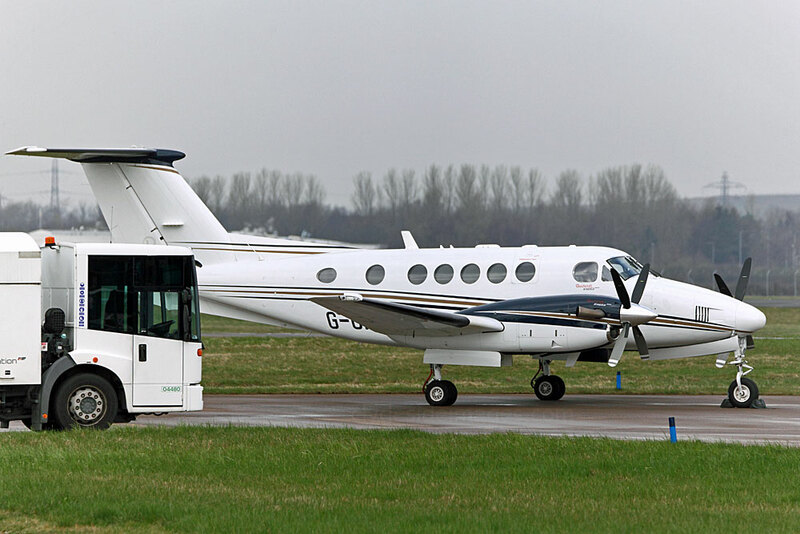 My trip, which lasted around 45 minutes and covered 120 miles, was superb and the staff were all friendly and very welcoming - you even get a glass of Prosecco when you get back on dry land. 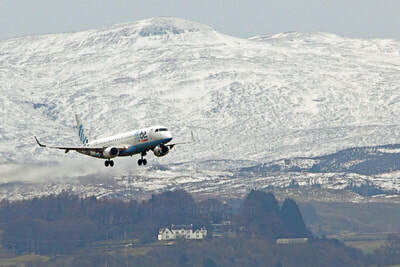 I hope to try one of the alternative routes next time, heading inland when there`s plenty of snow on the tops - that could be potentially even more spectacular. 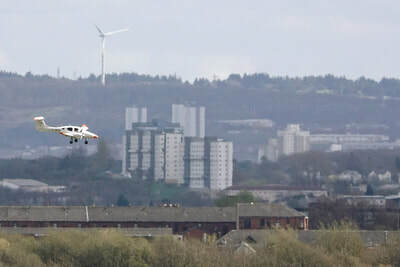 Additional shots taken on my seaplane flights to date and further information can be found here.